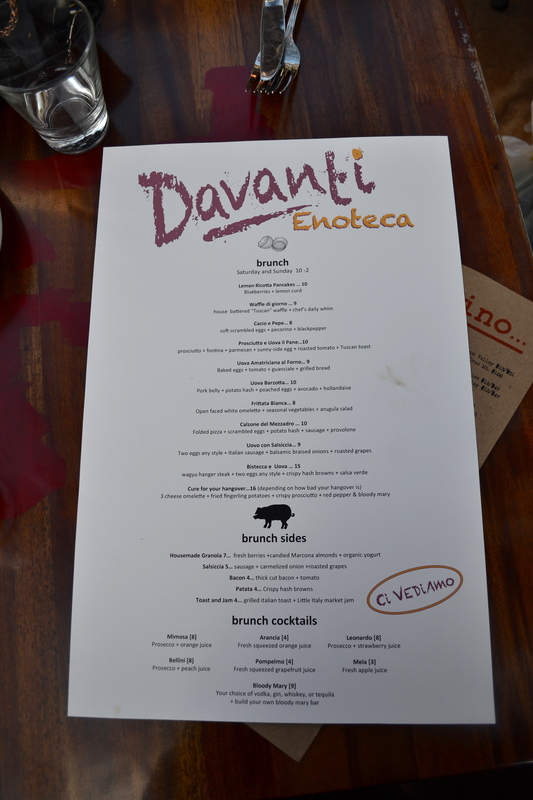 I’ve been a huge fan of Davanti Enoteca since the first time I went so its about time I had a post on them. 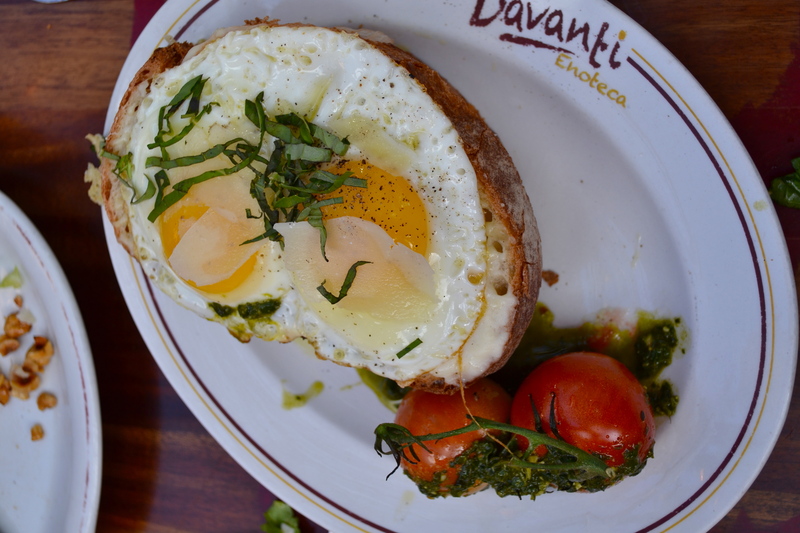 Davanti is fantastic for dinner but this post is on brunch which it turns out is pretty great too. We came here on a Saturday morning post-Little Italy’s farmer’s market and there were plenty of tables. Always nice to not wait 45 min+ for brunch. There are two appetizers that you absolutely must start with, and luckily they are available for brunch. 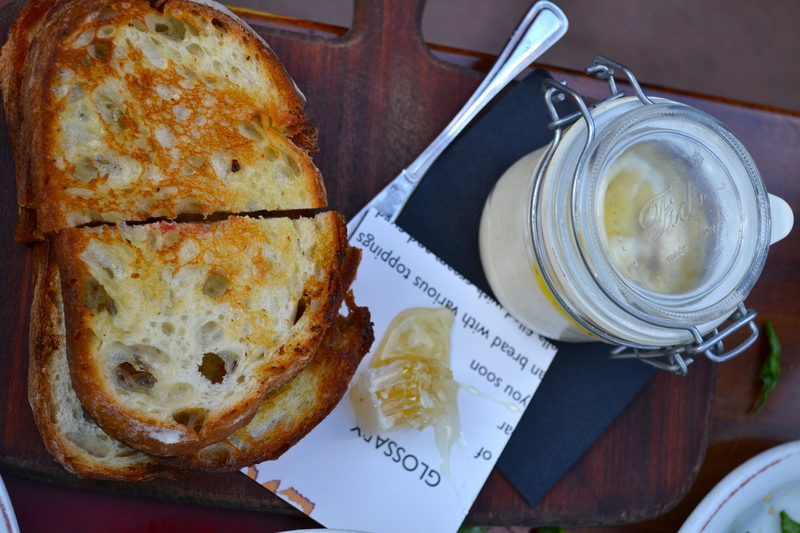 These are the focaccia di Recco a Ligurian style baked focaccia filled with soft cow cheese (add the honeycomb option) or the vasi with ricotta and honeycomb. Not both at the same time mind you because they are quite similar but one time order one and the next time the other. I personally prefer the vasi but most people I know like the focaccia di Recco better. We went with the vasi with ricotta and honeycomb this time. 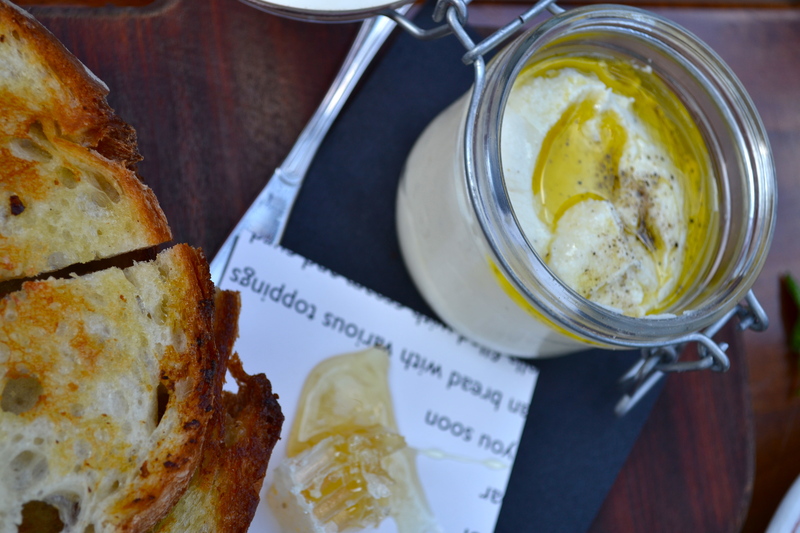 You get grilled Pugliese bread with a whiff of truffle oil, a jar of impossible creamy and rich ricotta with sea salt and olive oil, and a wedge of honeycomb. 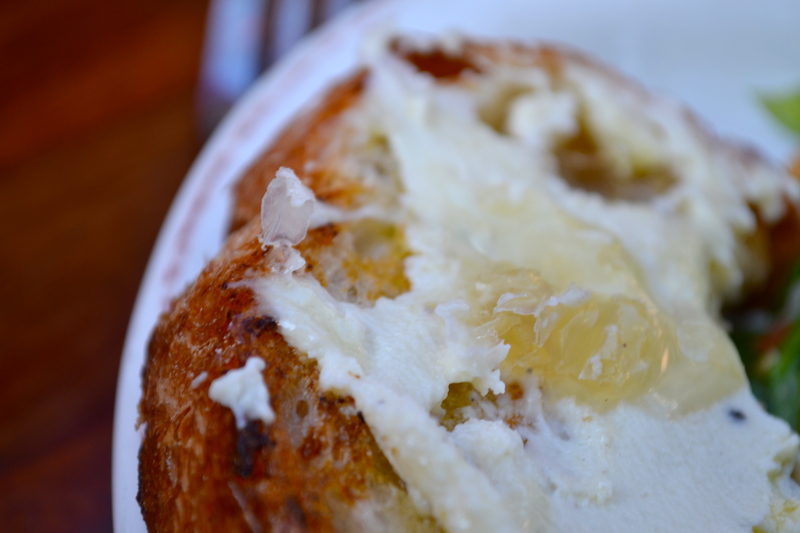 The combination of the toasty warm bread with cool creamy ricotta and sweet honeycomb is completely addictive. 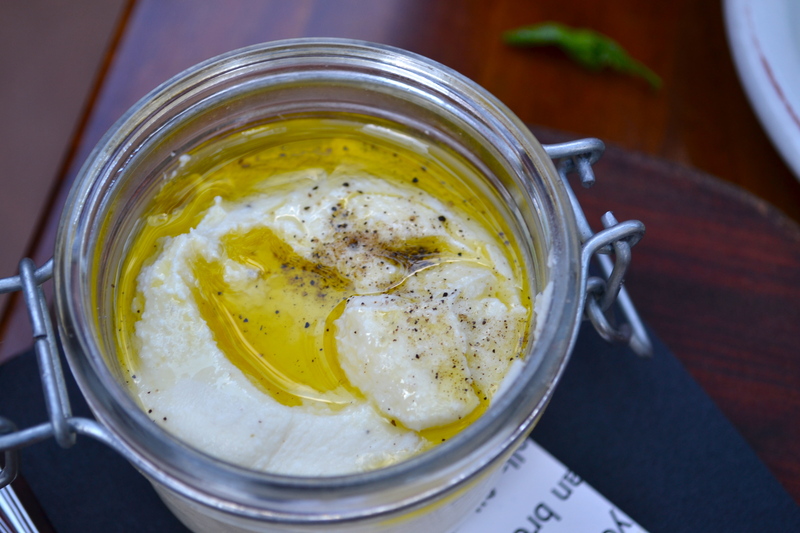 I do not know how they get their ricotta so smooth and creamy, I’ve tried both whipping it and blending it at home to obtain the same effect and sadly have not yet matched this texture. I suppose for $8 I can just keep coming here to get my fix for the real thing. 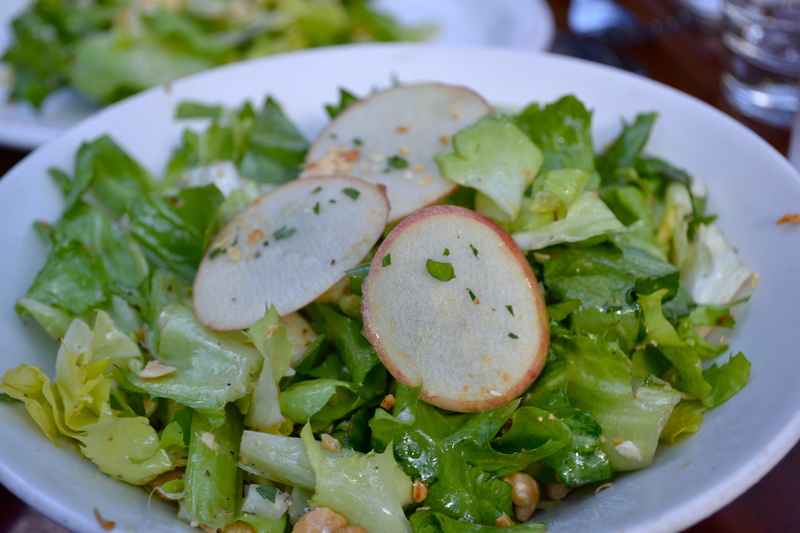 Next we ordered their salad with escarole + gala apple + pecorino dolce + celery + hazelnuts. It is a simple fresh salad and its also a sizeable portion. 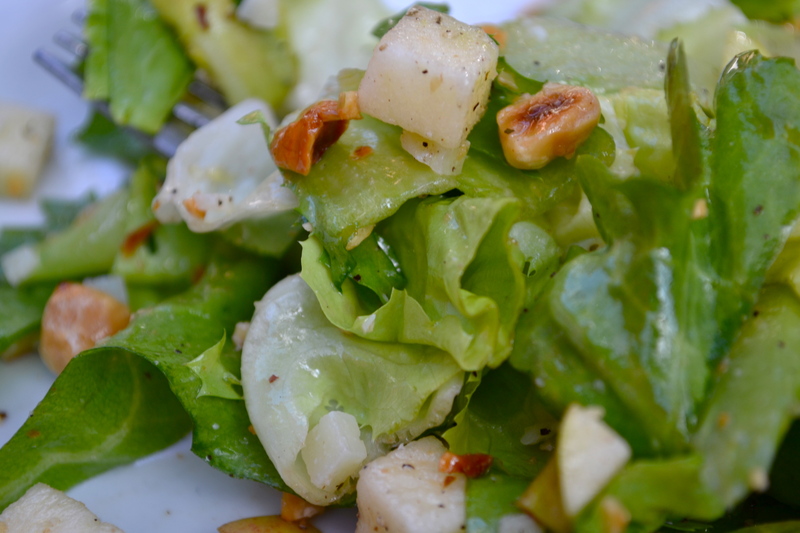 Simple and tasty with a basic olive oil dressing this is a light salad that has interesting texture and taste with the slightly bitter escarole contrasting with sweet cubes of gala apple, nutty toasted hazelnuts, crunchy celery and salty pecorino. Even though I am an avid meat eater I would not mind having this salad as an entree even though it also makes a mighty fine side salad when you are ordering pizza as your main dish. Love that even though the toppings might look scarce on top when you mix up the salad there are plenty of all the other components so as to ensure that you’re not just eating fistfuls of escarole like a rabbit. 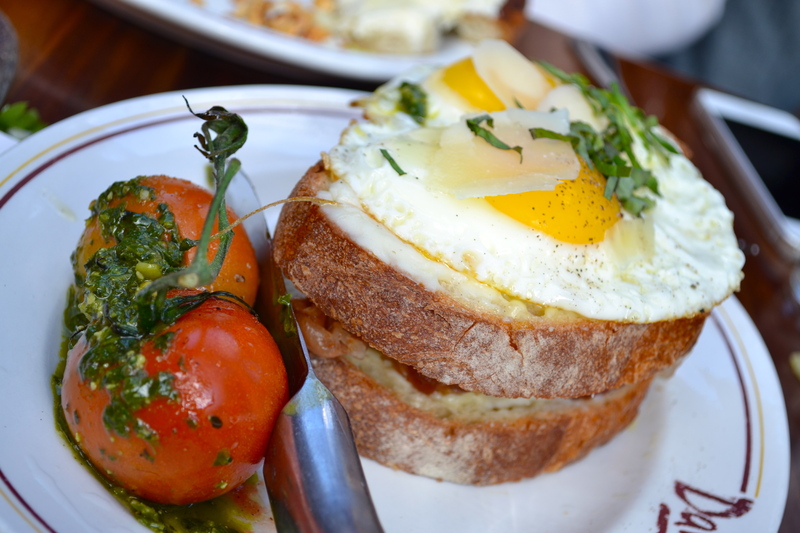 So for the actual brunch dish we ordered we went with the Prosciutto e Uovo Il Pane which comes with toasted tuscan bread with prosciutto, fontina, parmesan cheese, sunny side eggs on top and roasted tomatoes on the side. This was amazing and the portion was large enough that we split it between two people and still had leftovers (ok we also ate all that other food before too but I maintain its split-able). 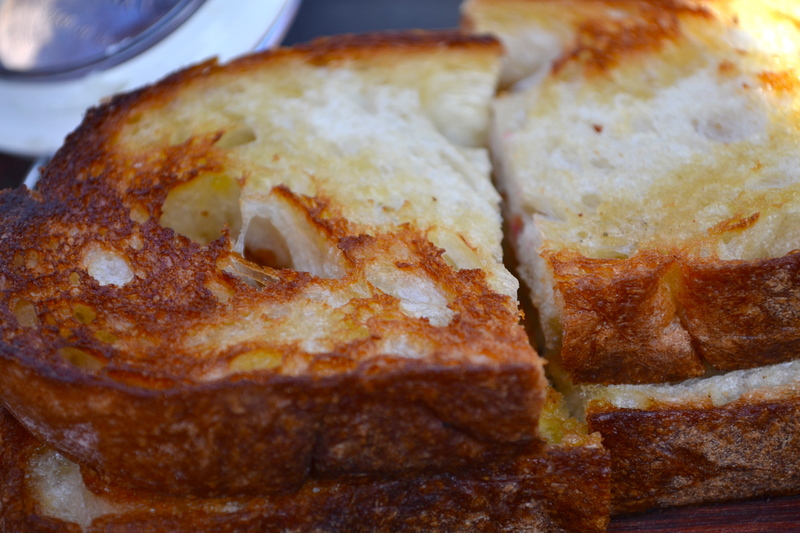 The prosciutto is super crispy and the cheese is nicely melted into the toast. 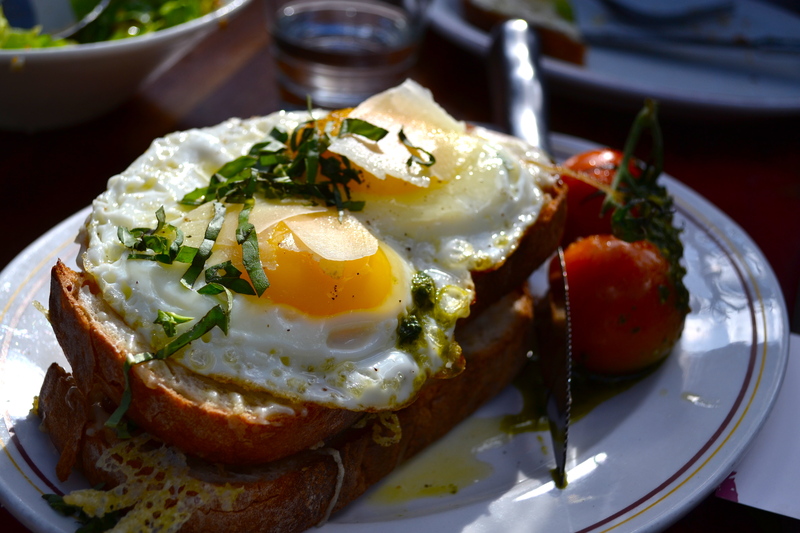 Mix it together with the runny fried eggs (make sure to request them more cooked if runny is not your thing) and the juicy roasted tomatoes and you have a perfect bite. 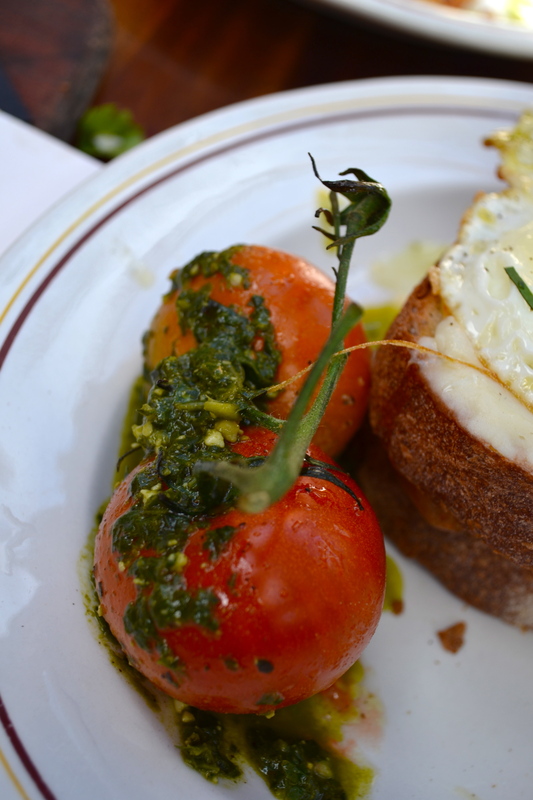 Also appreciated the pesto on the roasted tomatoes as pesto makes almost everything better. 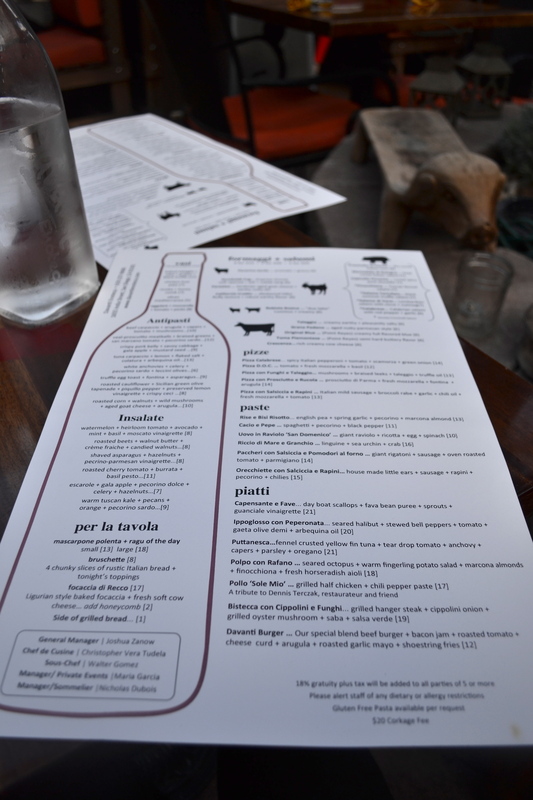 Overall had a lovely and very reasonably priced meal with fantastic service to boot. Our waiter was friendly, super attentive, and even offered to take our picture before we asked, most likely because it was hard to ignore my fat Nikon intrusively sitting on the table for the duration of the entire meal. It was also about 75 degrees and sunny so sitting on the patio was quite nice. 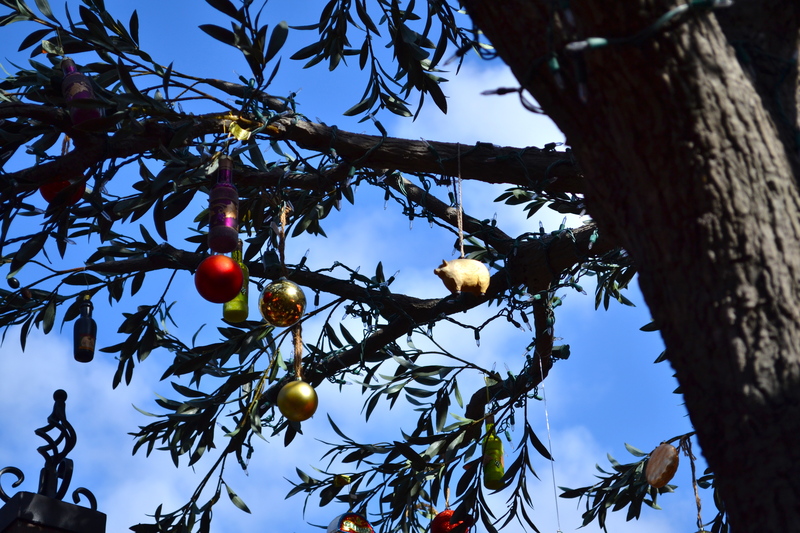 Although I suppose I have to attribute that part to the amazingness that is San Diego in December. 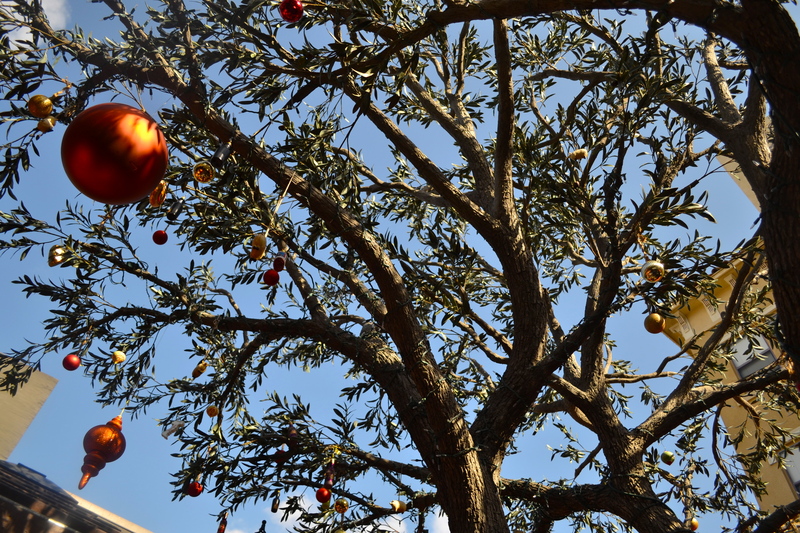 Loved their Christmas decorations too. If you go to New York one of the best deals you can get in terms of fine dining is the $38 dollar two-course lunch at Jean-Georges. Although it might seem a little steep for two courses Jean-Georges is a three Michelin star restaurant and I’d take two courses there over four courses in a lot of places. 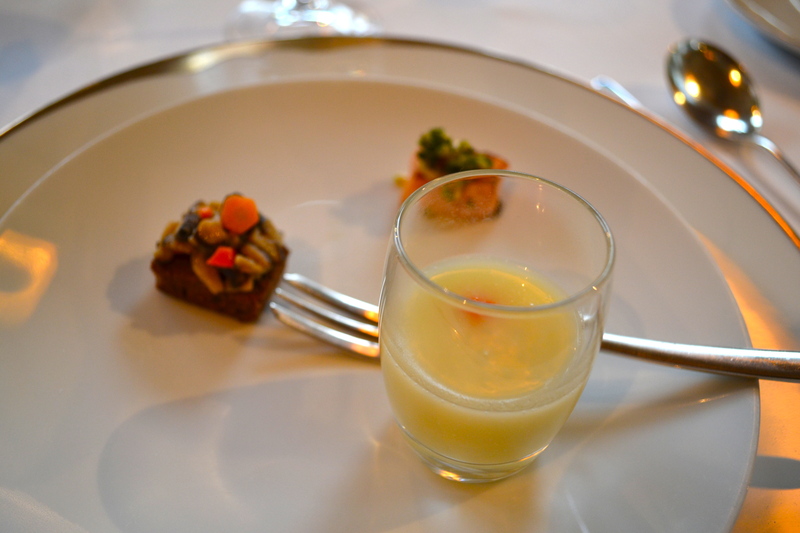 Plus you get an amuse bouche and a mignardise course at the end. Not to mention a very diverse bread basket. As for the amuse bouche it varies but with the mignardise there are always many types of chocolate, cookies, marshmallows and pate de fruit. So reallyyy you kindof are getting four courses for $38. 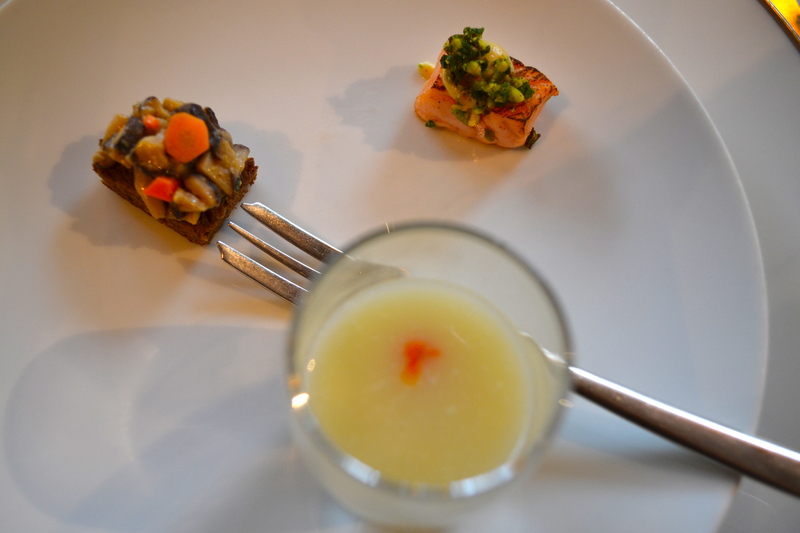 AMUSE BOUCHE: For the amuse we had a toast with wild mushrooms, root vegetable soup with chili oil and salmon with pistachio pesto. All quite nice but I think the salmon was my favorite. 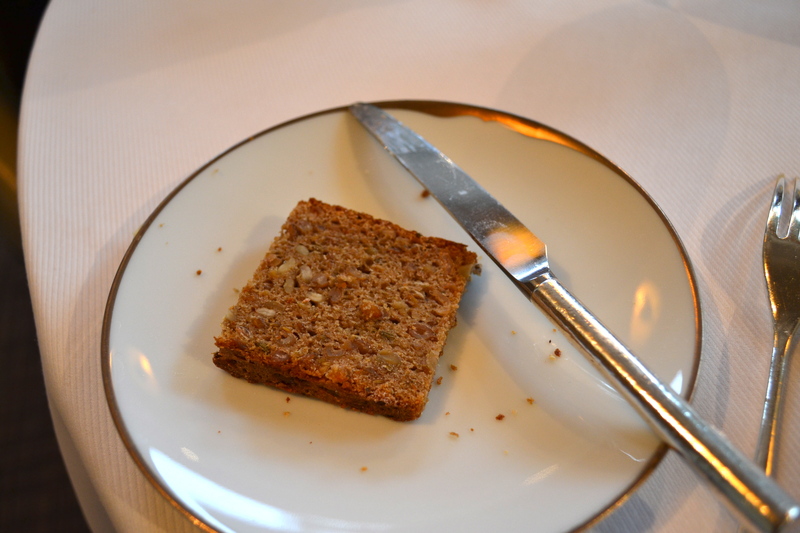 BREAD BASKET: They have various types of bread; I tried the ciabatta and a Swedish rye bread. Both were excellent and the butter is of amazing quality. 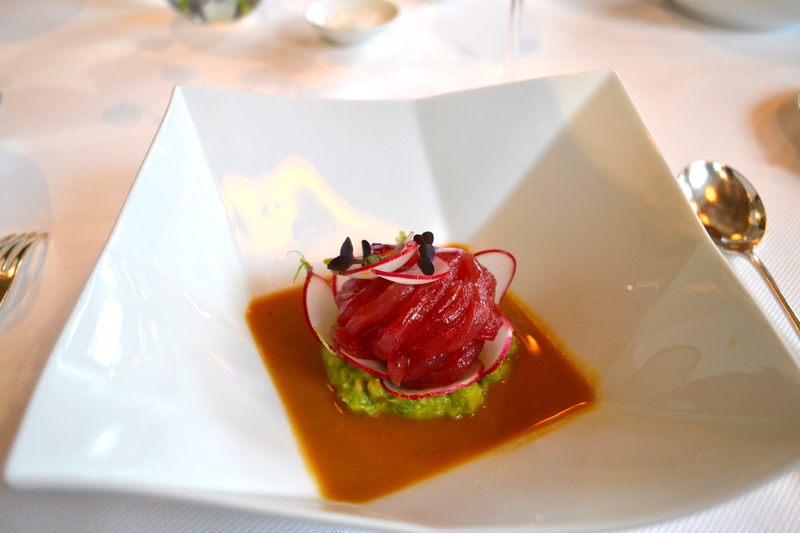 APPETIZER: For the appetizers we tried the Yellowfin Tuna Ribbons which came with avocado, spicy radish, and ginger marinade. In terms of flavor these are a familiar taste profile nothing out of the ordinary but the way they cut the tuna ribbons was impressive and created interesting texture. So much tuna too. 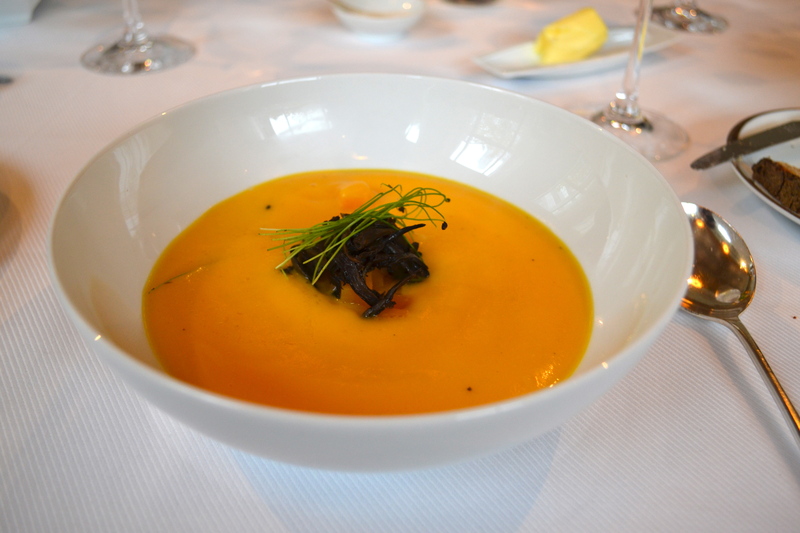 We also ordered the Butternut Squash Soup which comes with black trumpet mushrooms. Usually I’m not a fan of butternut squash soup as I find that most have too much cream and sugar so it feels like you are eating some weird soup-dessert hybrid. This one was incredibly smooth and just the right amount of savoury with the mushrooms. 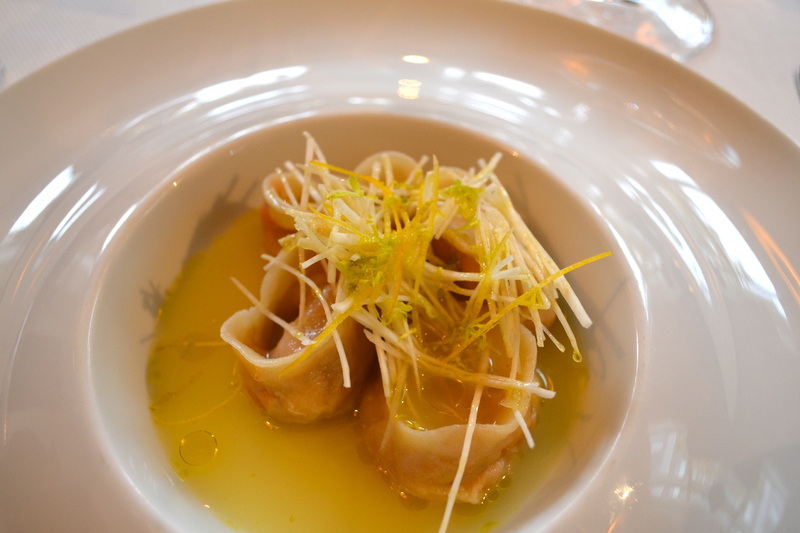 Lastly we also tried the Peekytoe Crab Dumplings that come in a Celeriac-Meyer Lemon Tea. These were pillowy and all lump crab inside, no fillers here. 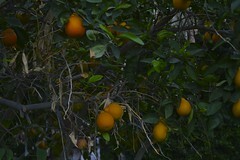 Together with the fragant lemon-y “tea” sauce they were quite nice. Next time though I want to try the Hamachi Sashimi with avocado, yuzu and radish as that is a constant in their menu and JG is known for it. ENTREE: For entrees we ordered the Hake which came with a spicy jade emulsion and tender celeriac. The braised celeriac had great texture and taste I’ve never had it before but it reminded me of braised artichoke hearts. 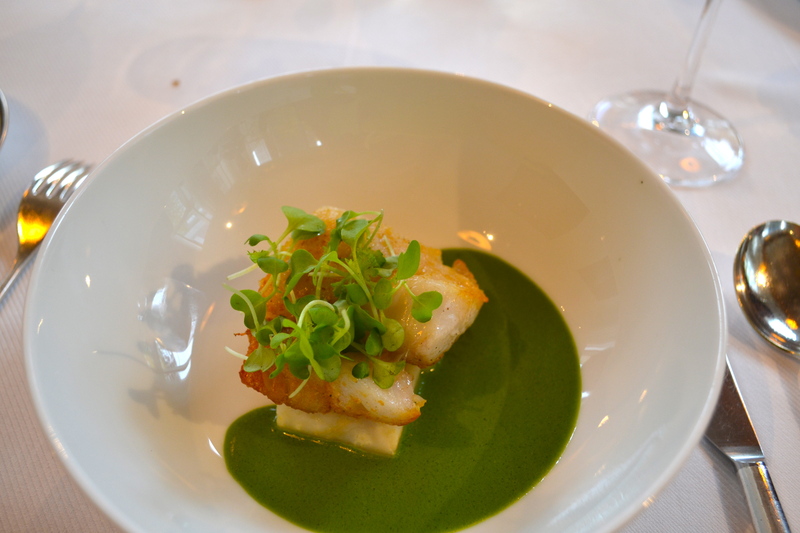 The spicy jade emulsion was lovely and the only thing I didn’t love was the very flaky texture of the hake but I think that’s just a personal preference of mine. 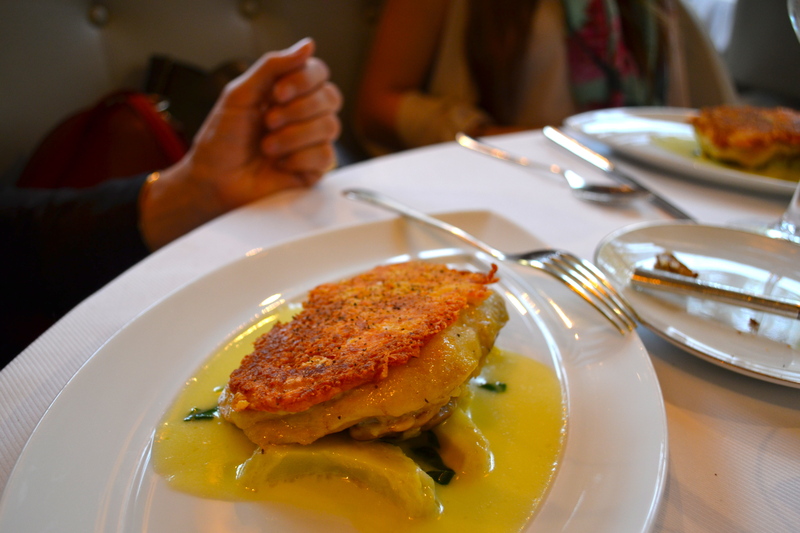 One of their largest entrees and the most picky-eater friendly entree as well is the Parmesan Crusted Organic Chicken. Its a huge piece of super juicy chicken and with the cripsy crust and the rich sauce its hard not to like it. 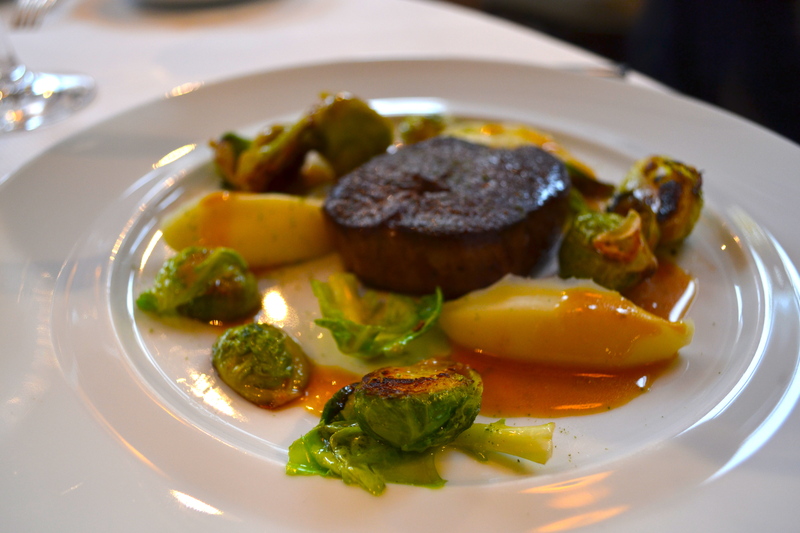 The last entree we ordered was a supplement to the regular menu, the Caramelized Beef Tenderloin it comes with miso butter, parsley root puree, brussel sprouts and is a $20 supplement. They always have a variation of a beef and sucking pig supplements which are usually $20 and $10 dollars respectively. Last year I ordered the beef one and got probably one of the best steaks I have eaten in my life, super charred on the outside and perfect medium-rare inside, it came with caramelized squash and a spicy butter sauce and was worth every penny. This year the steak was nice but not amazing, I don’t think it was worth the $20 price tag and the combination of flavors in the plate wasn’t that novel or fantastic. DESSERT: Because we could not help ourselves we ordered a dessert course to share (this is not included in the two-course meal). 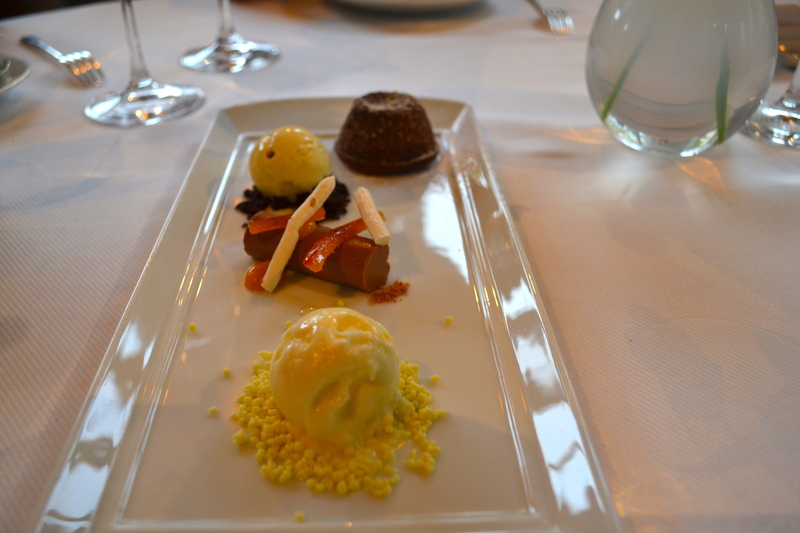 Their desserts come as ‘tastings’ usually with four elements that are supposed to complement each other and all share a common theme (like ‘cherry’ or ‘chocolate’). 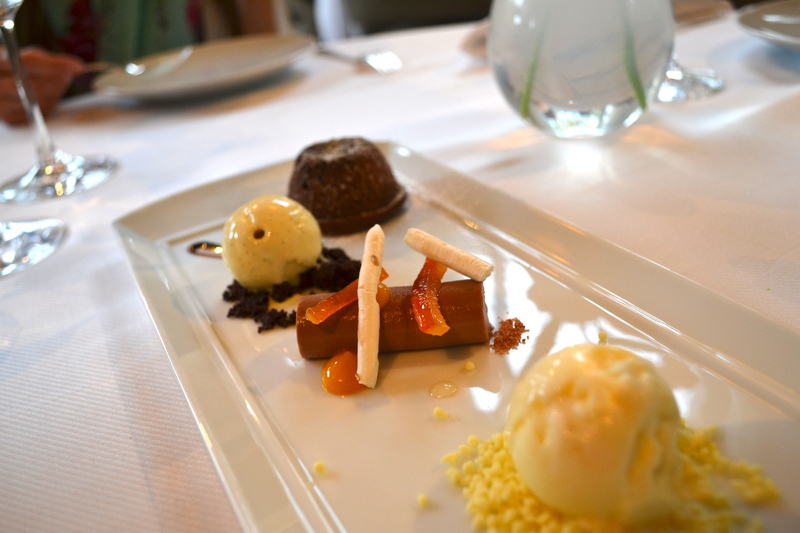 We naturally went with chocolate and it came with white chocolate ice cream with yuzu crumbs, milk chocolate panna cotta (the tube thing) + mango gel + smoked salt meringue +candied orange, and their famous warm chocolate cake with a vanilla bean ice cream on some other type of crumbs I forget. BIRTHDAY CAKE: We had a birthday in our midst and so we were presented with their Happy Birthday cake which is a rich multi-layer chocolate and chocolate ganache cake. Amazing. Definitely lie about it being someone’s birthday for this baby. 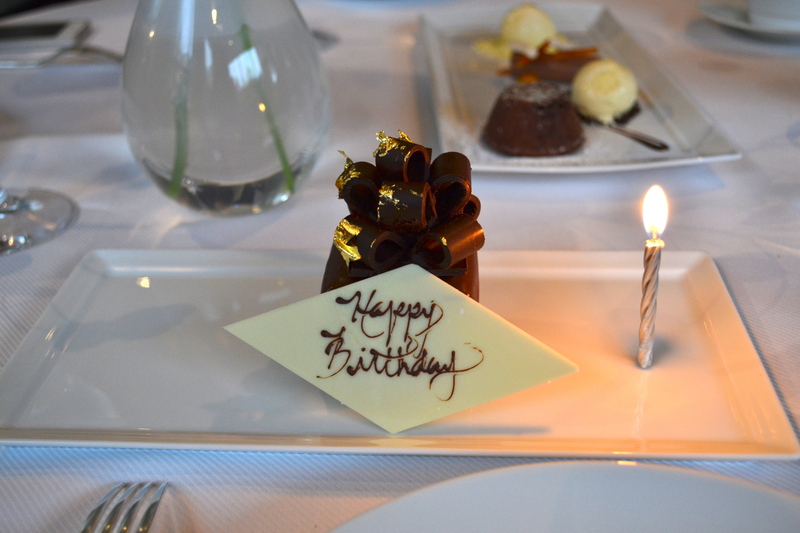 MIGNARDISE: Whoops. I feel like I do this in 50% of my restaurant posts but yes did not take any pictures of the mignardise because they were promptly devoured. They included two kinds of pate de fruit, a crispy almost rice crispy-like cookie that was lavender flavoured I believe, chocolate truffles in a flavor I can’t remember, macarons and the most heavenly cloud-like vanilla bean marshmallows. 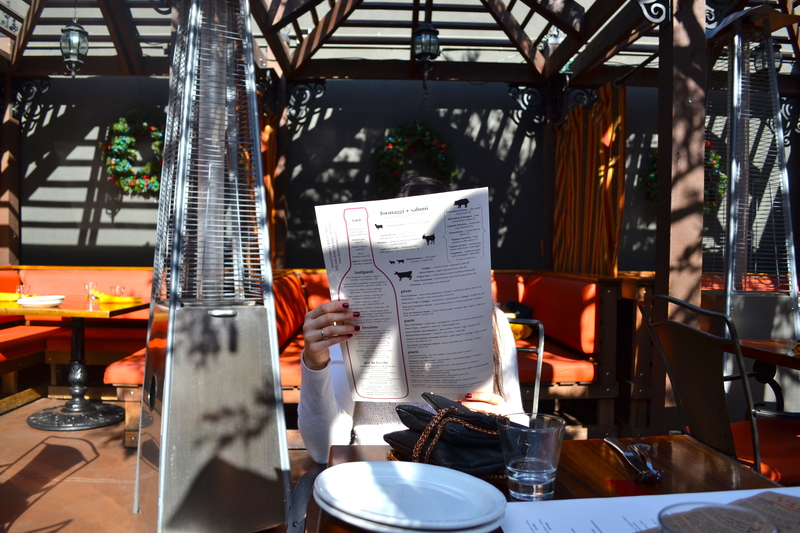 All in all a fantastic lunch experience and the service here is really top notch. 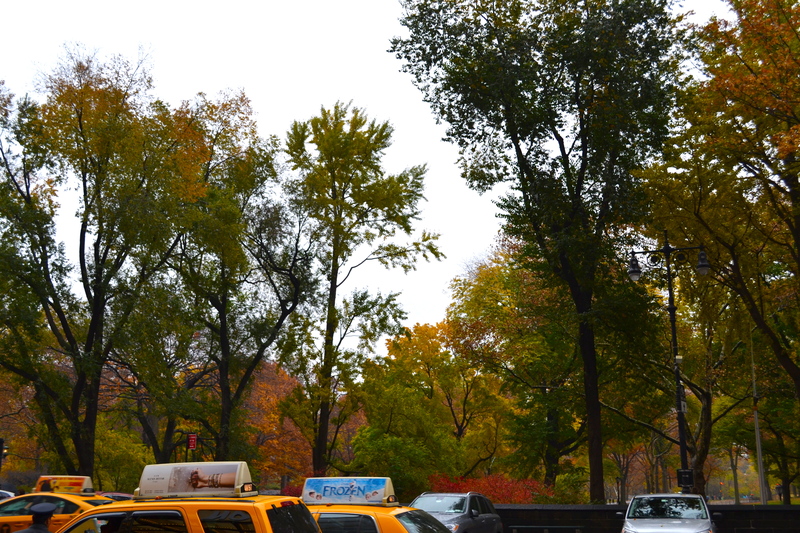 There is a more formal air but everyone is very polite and friendly. Last year when we had to somewhat rush lunch because I had a flight to catch they were more than obliging. Their food is basically fine French food with Asian elements and they really nail it. 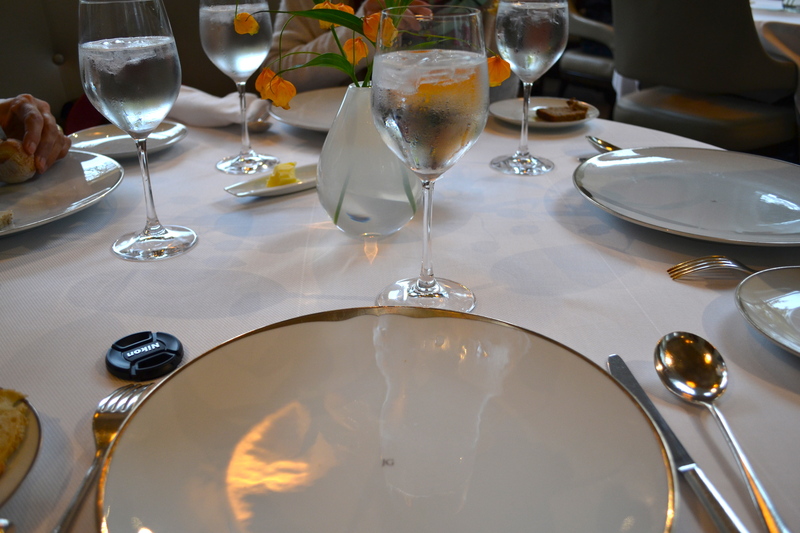 No weird molecular gastronomy stunts or foams and jellies but just amazing quality extremely well-prepared food. And for $38 dollars its definitely a steal. 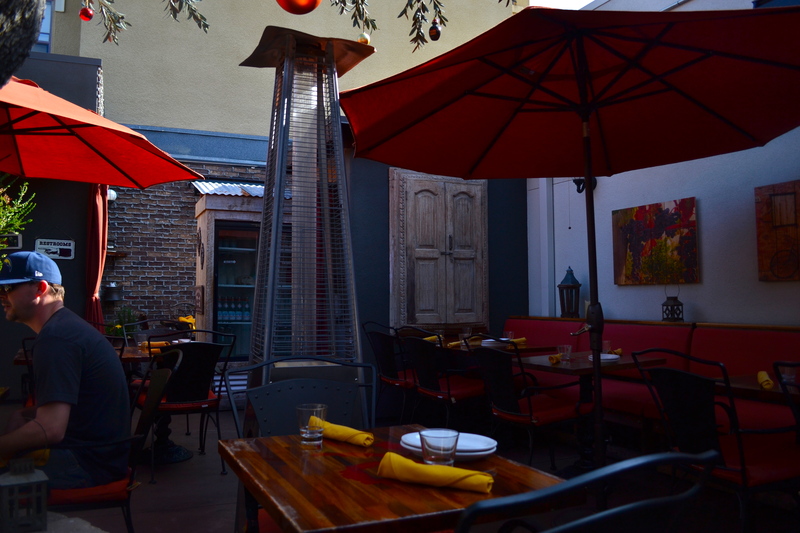 Just make your reservations a couple weeks ahead of time. 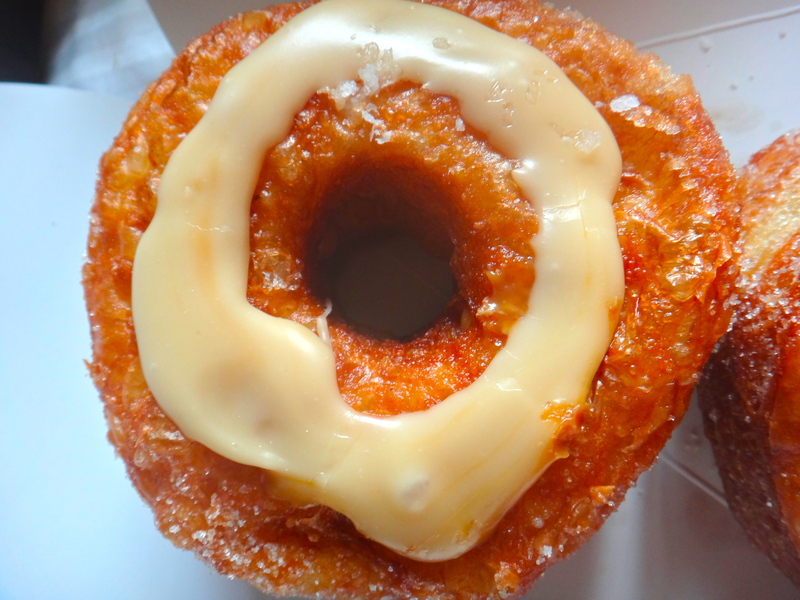 Perhaps I am disqualified from properly judging this particular cronut flavor because I dislike things that are overly sweet (white chocolate, fudge, caramel….) 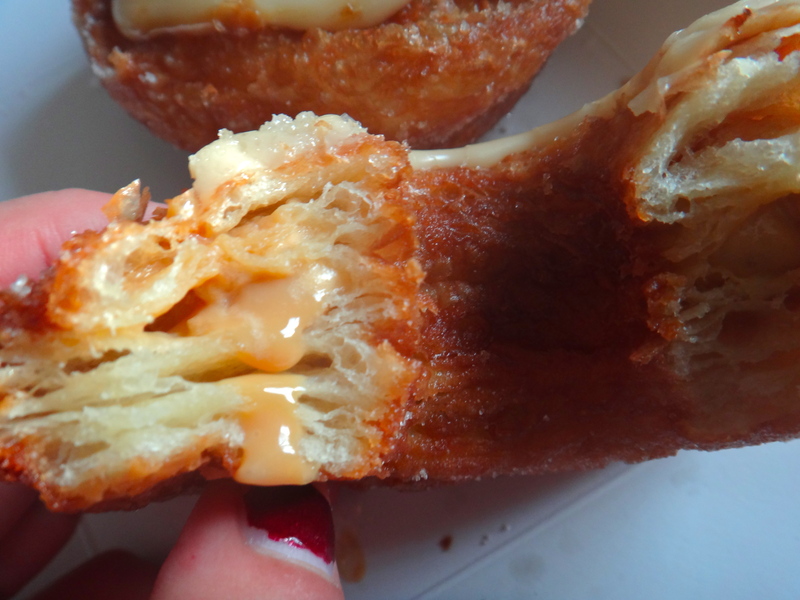 but on the other hand I love dulce de leche so this should have been amazing. Although I appreciated the flakes of sea salt to offset how sweet it was it was still SO SWEET. And very very buttery. A little too buttery for me. I had one bite and I think that was all I could eat. It’s not all bad news though, could definitely see this being delicious with the right flavor, maybe something more tart like raspberry? And it was perfectly executed, crisp shell on the outside, soft flaky layers inside and perfectly smooth dulce de leche cream between the layers. Lest ye abandon all hope. 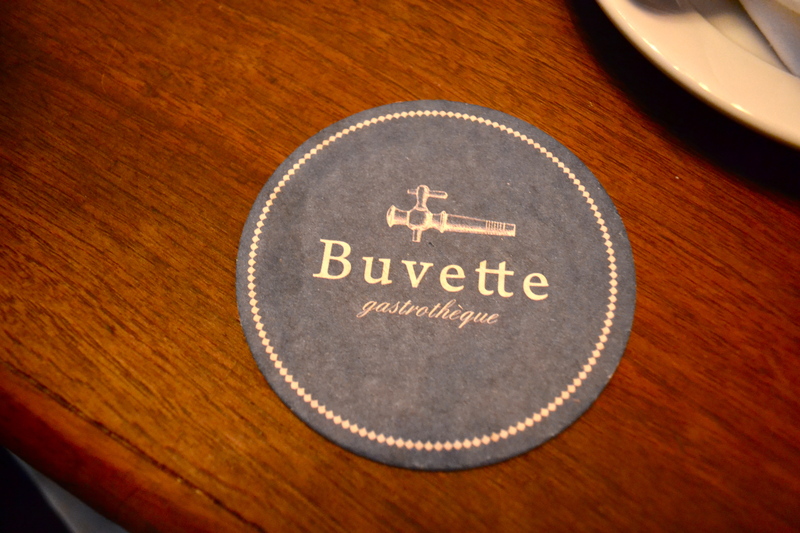 Buvette is a lovely little (and I mean little) bistro style restaurant in the West Village. 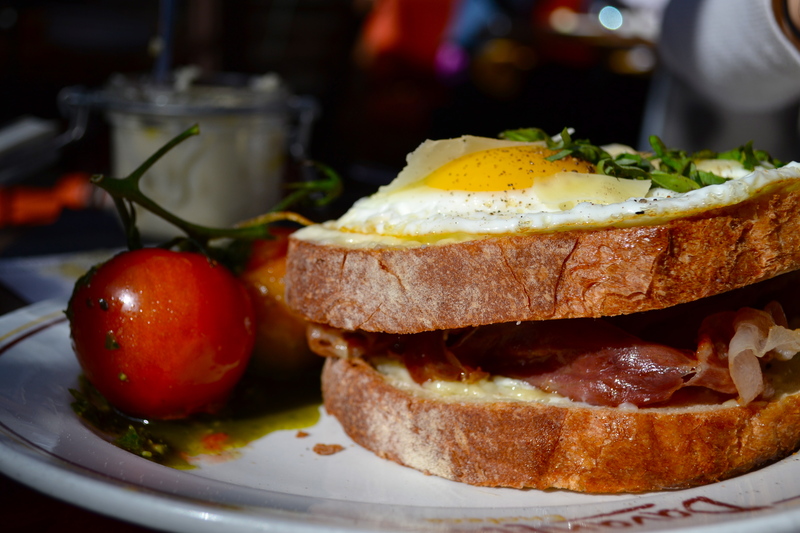 We always go for their unbelievable Croque Monsieur/Madame and for the best chocolate mousse in the world. The menu is fairly small and fairly traditionalist French with croque monsieurs, charcuterie, steak tartare, duck confit rillettes, coq au vin, tartinettes, etc. Portions are somewhat small too so be advised (perhaps that’s French too?). 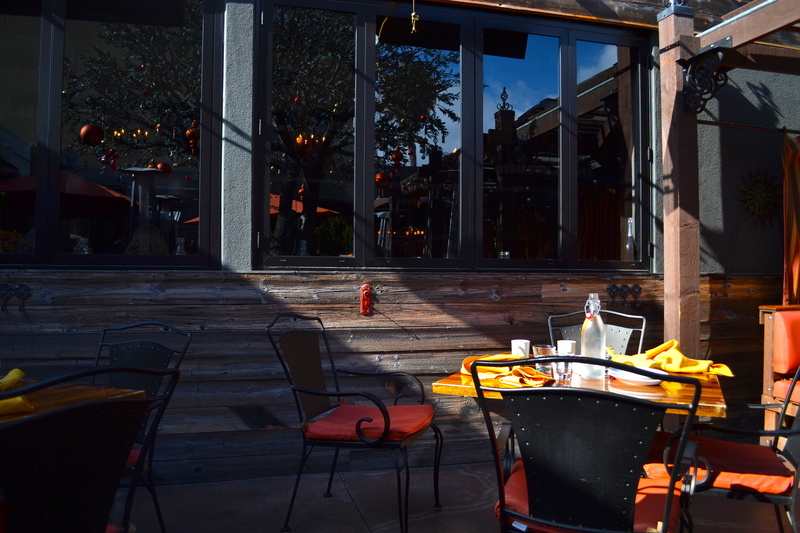 We prefer to come here for breakfast/brunch. 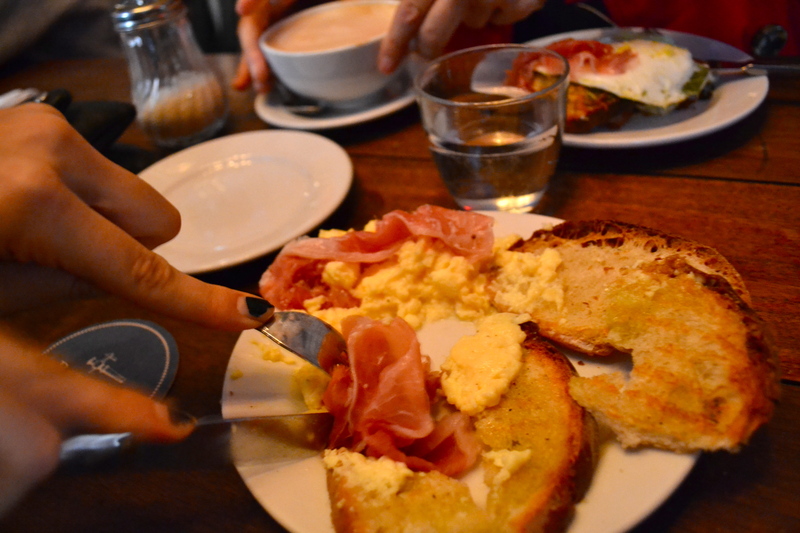 This time we all shared the Steamed Eggs with Prosciutto, which seems small but with the bread it becomes a more substantial meal. Not substantial enough because we also individually ordered the Salade de Poulet which sounds boring but is actually quite nice. 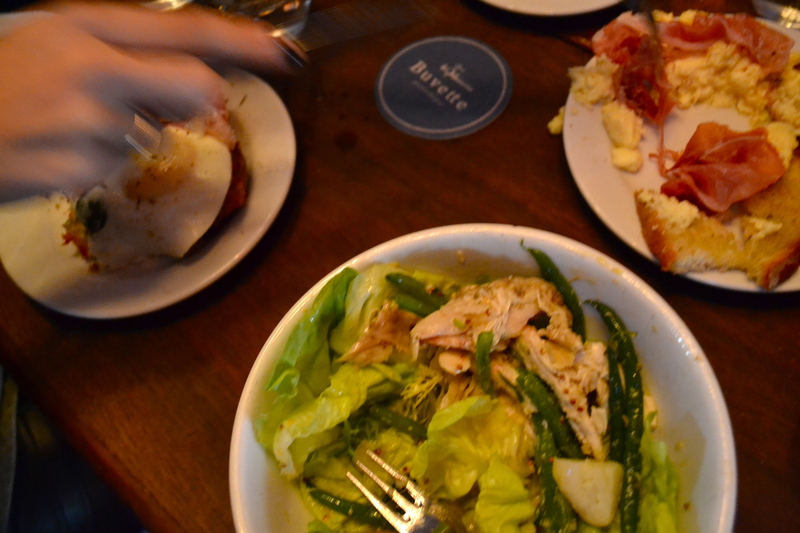 It comes with shredded roasted chicken, green beans, potatoes, butter lettuce and creamy mustard dressing. 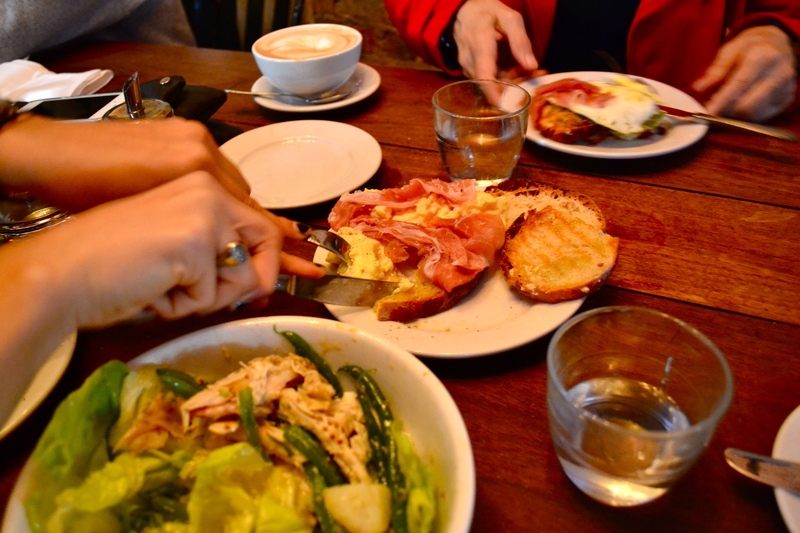 Probably one of the lightest things you can get at Buvette even with that rich dressing. The Croques. You truly cannot go wrong with any of them. 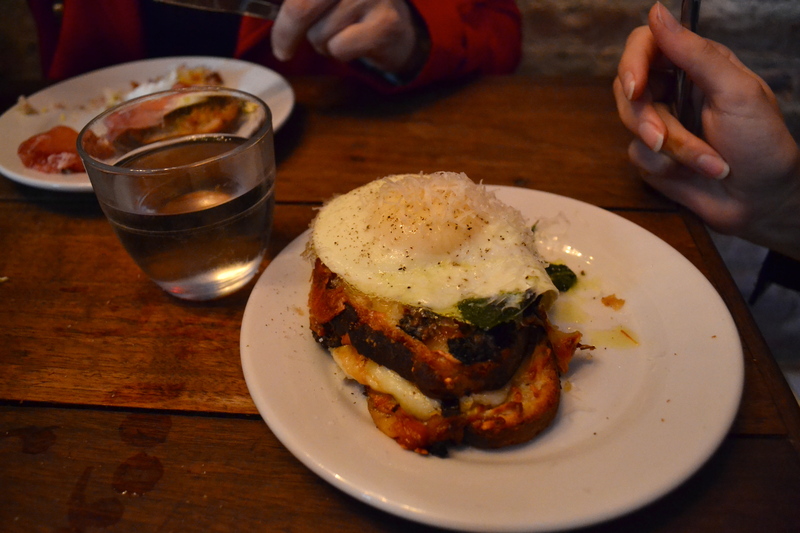 At most places vegetarian attempts of “real food” are often dismal but here the Croque Forrestier with creamy bechamel sauce and wild mushrooms is as good as the Croque Monsier with prosciutto and the Croque Madame with prosciutto AND an egg. All have gruyere and despite their apparent diminutive size these things are super rich and they pack quite the punch. 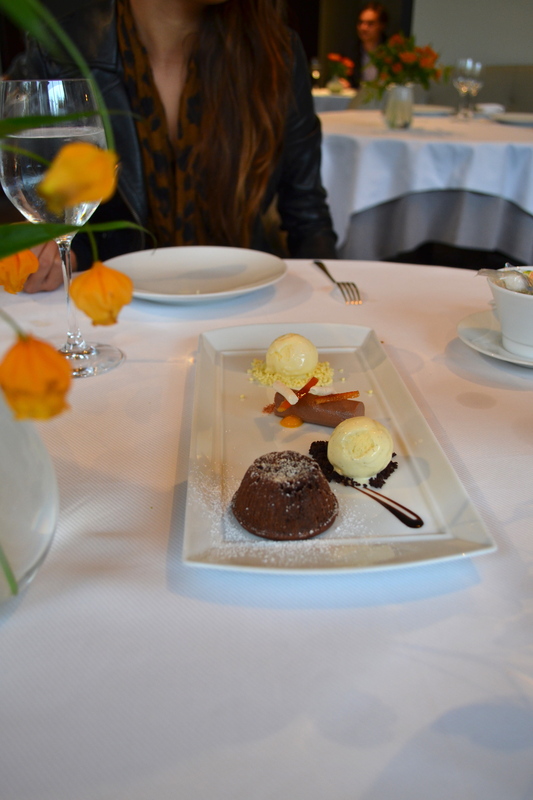 Lastly to end you must order the Chocolate Mousse. 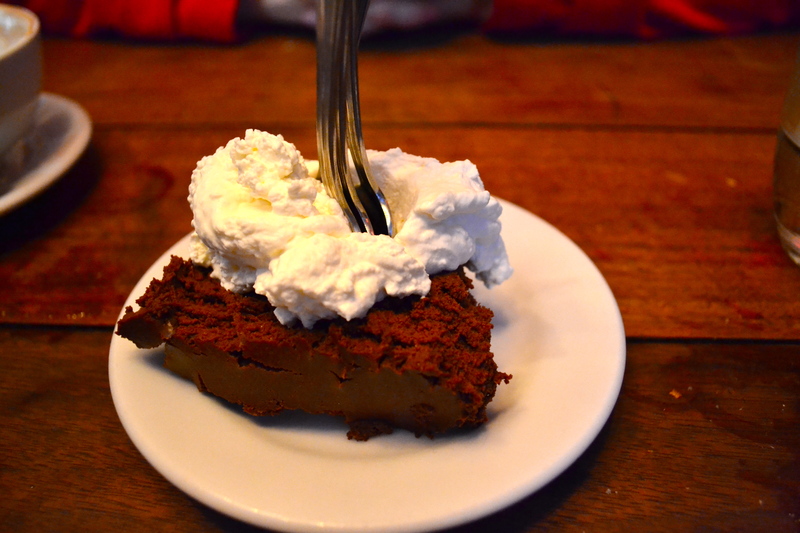 I solemnly swear it is the best chocolate mousse I have ever tried. Incredibly rich and chocolate-y and with a texture so dense its almost chewy. We sneakily tried to find out what was in it by pretending to have a range of allergy afflictions and self-imposed dietary restrictions from lactose intolerance to keeping kosher in order to find out if there were dairy, eggs, nuts or gelatin in it. Sneaky. And for the record there is no dairy in the mousse itself (not including the whipped cream on top of course) and no gelatin. Hmm. More to come and please forgive the amount of chipped nail polish in these pictures. Probably should have gone with gel nails. I have always strongly disliked raw red onions. Even though in small amounts they can be tasty and cooked they are delicious, nothing can ruin a salad or a burger like huge chunks of raw red onion. Maybe its just me, but that sharp taste will stay in my mouth all day no matter what I eat or how many times I brush my teeth. Ick. 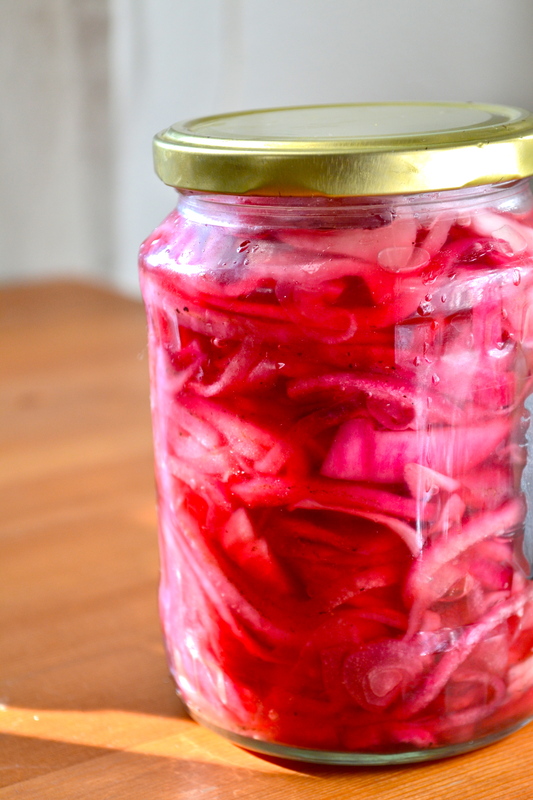 But pickled red onions. Those are a whole other story. 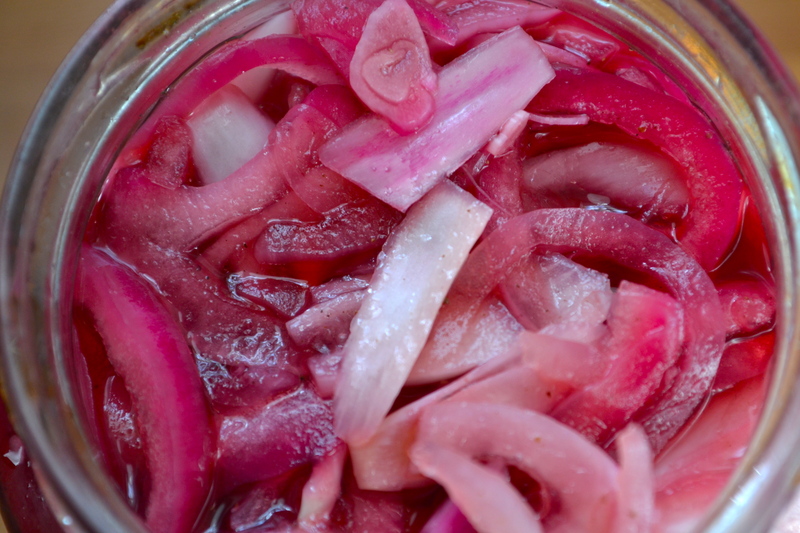 Two essential things to make raw red onions more palatable are slicing them thinly and adding an acid. 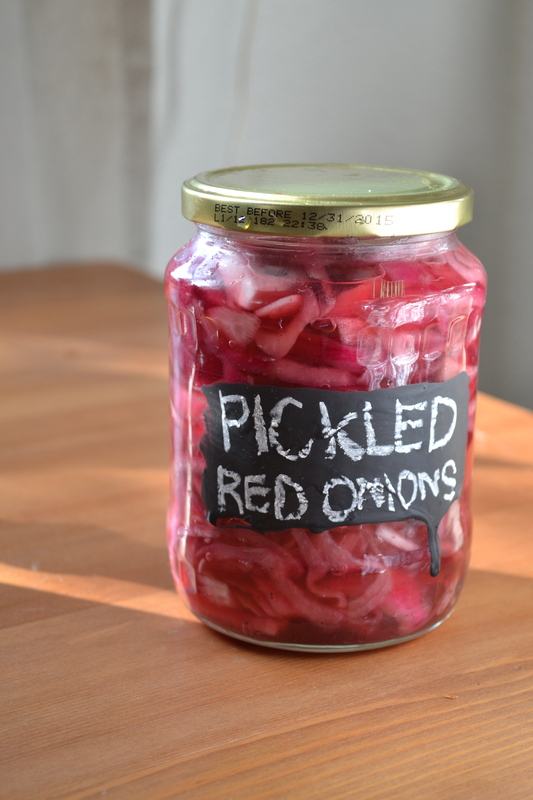 For this picked red onion recipe you do both. How handy. 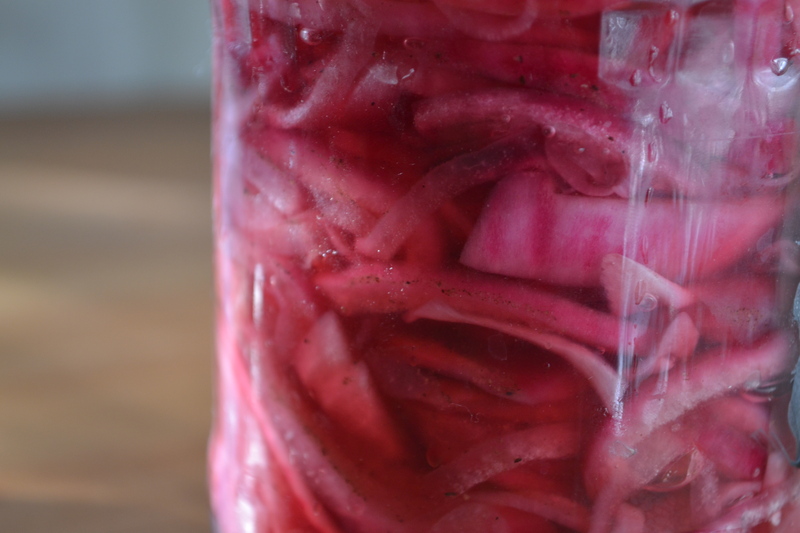 For some reason when I think of pickling I think of boiling jars and pickling salts and all kinds of other things that I don’t really want to pursue. But luckily you really only have to do those things if you want your pickled whatevers to last more than an year. 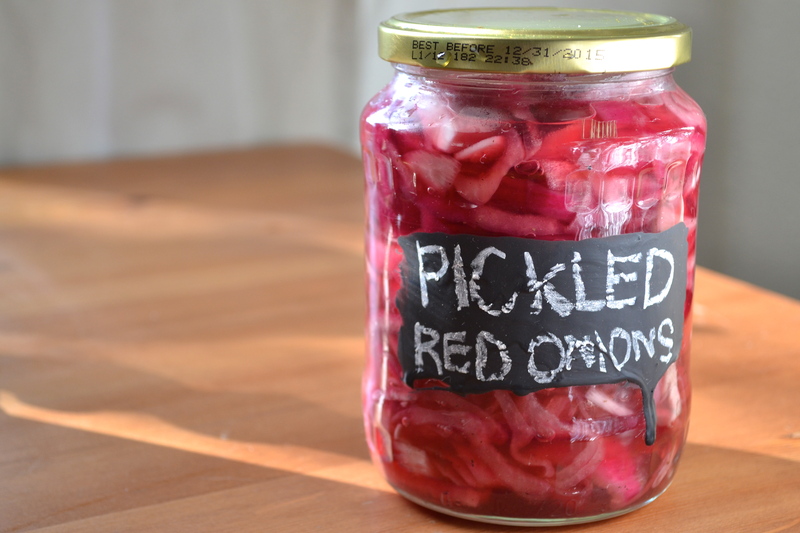 With this simpler pickling method they should be good for 3 weeks, which is fine by me. 1. Thinly slice the onion and set apart. If you have a mandolin this would be a great time to bring it out. 2. Set aside the onions in a small bowl. 3. Bring all the other ingredients to a boil. 4. Pour the boiling mixture over the onions in the bowl. Cover with plastic wrap and let sit overnight (or until completely cool). 5. Once its cool, transfer it to a jar and keep in the fridge. It will keep for three weeks. 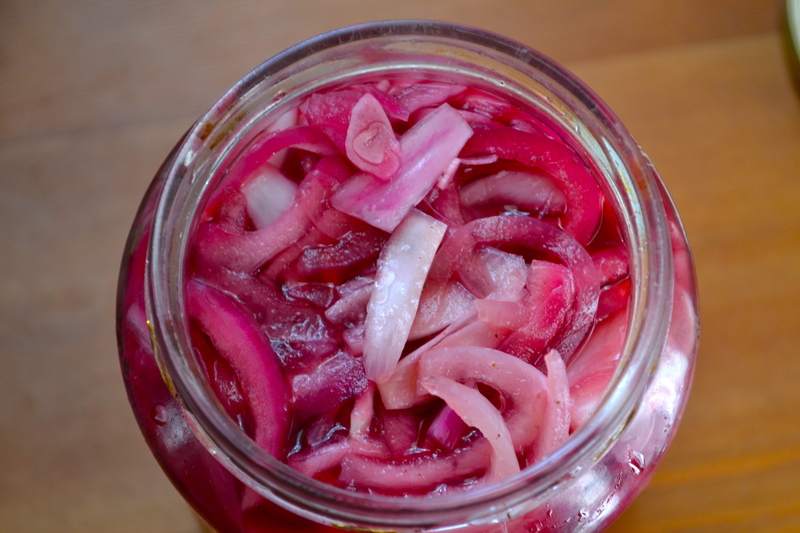 Pickled red onions have even more tang and sweetness, they retain their crunch yet that sharp lingering taste is gone. Plus they turn a lovely pink color and look quite nice on everything. 1. Feel free to customize the spices. Thyme, rosemary, jalapenos and lime would be great additions as well depending what you’re going for. 2. And the amount of sugar. 3. If you want your onions a bit softer you can throw them into the boiling vinegar mixture for 20 seconds before draining and letting it sit until cool. 4. If you don’t have white vinegar, apple cider vinegar, rice vinegar, or another more neutral tasting vinegar would work nicely. 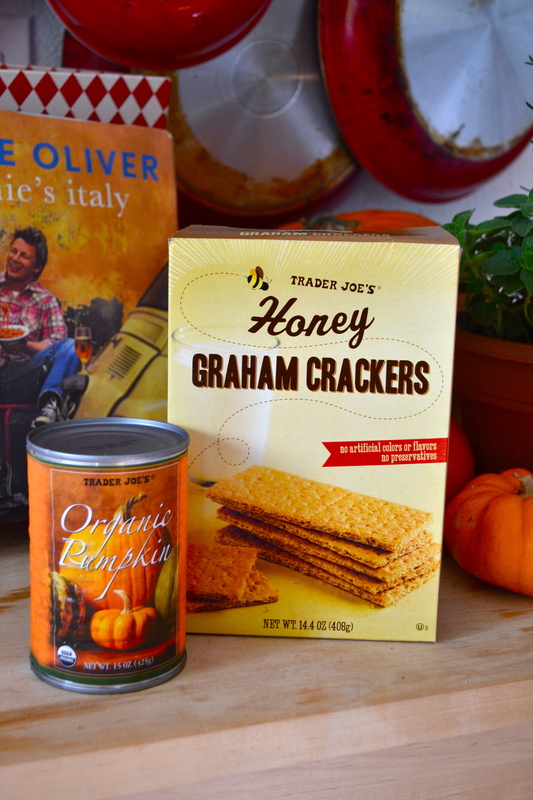 No idea what to do with that extra can (or half can) of pumpkin puree lurking around your kitchen? 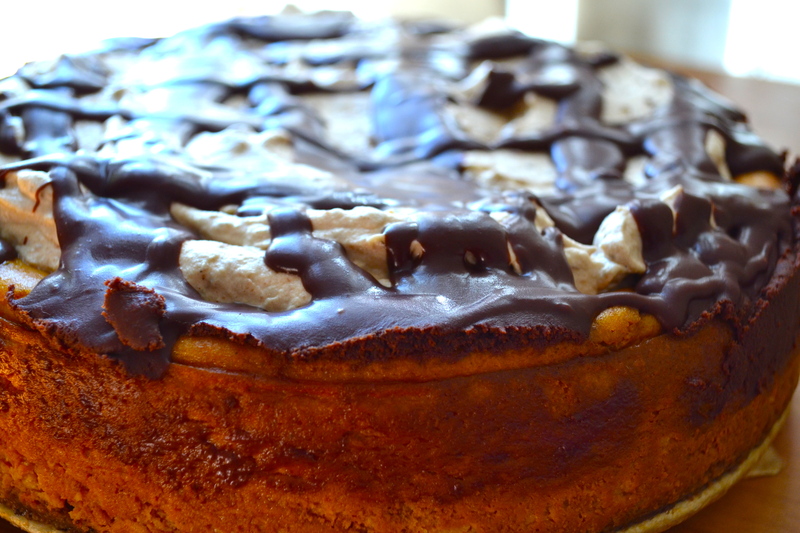 This cheesecake is a great way to use that and incorporate some fall flavours with a twist if you are pumpkin pie-d out from the last couple weeks. And by ‘with a twist’ I mean we add copious amounts of white chocolate and cream cheese to these so-called fall flavours. 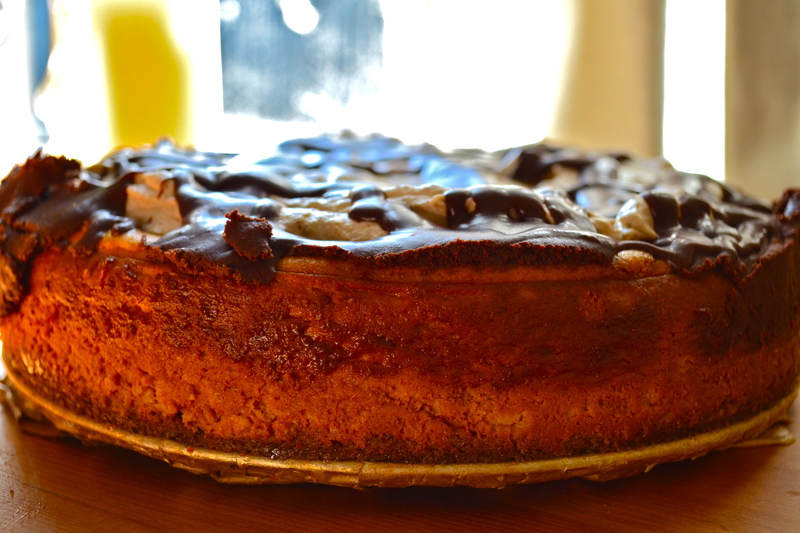 This recipe is based off a Nigella’s recipe for London Cheesecake. I personally like how the London Cheesecake is denser and richer than the New York Cheesecake which has whipped egg whites and less egg yolks. 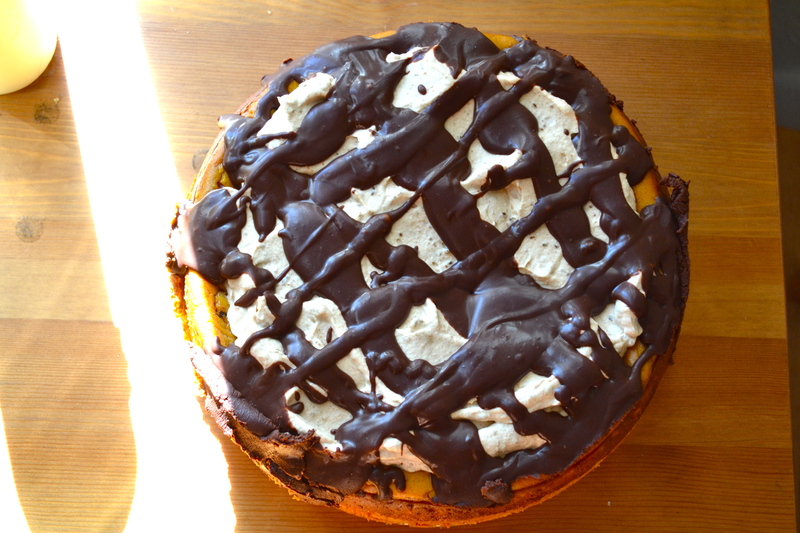 I do Americanize this London cheesecake by adding more sugar than Nigella does. 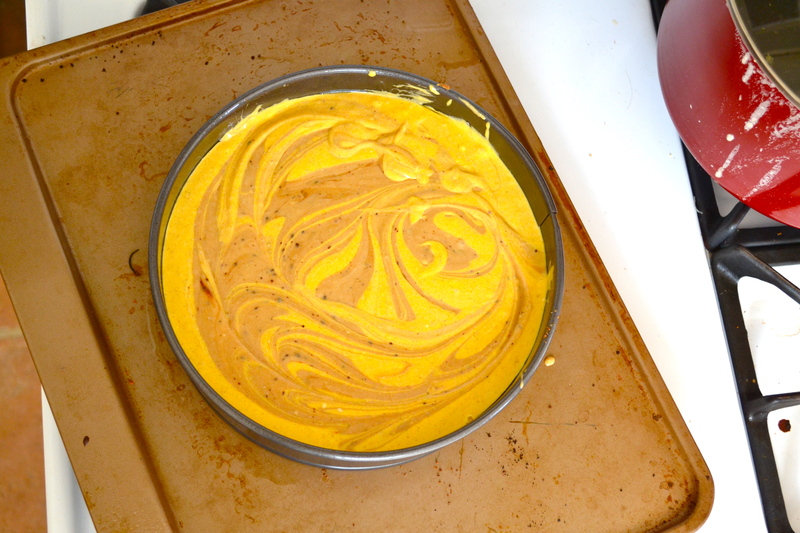 After making this basic cheesecake batter you split it into two bowls and add pumpkin to one half and the caramelized white chocolate to the other. For the caramelized white chocolate that is a ingenious recipe from David Lebovitz. As someone who finds plain white chocolate too cloying this adds some dimension and toastiness that makes it have an almost dulce de leche taste to it. You can make the caramelized white chocolate ahead of time and you can find the recipe here. The warm toasty notes from the caramelized white chocolate work splendidly with the cinnamon and spice in the cheesecake and sweet vanilla white chocolate offsets the more squash-y vegetable taste from the pumpkins. Or at least I think they taste kind of vegetable-y anyways. 1. Process graham crackers until they are fine crumbs. Add to a bowl with the melted butter and mix to combine. Line the bottom of a 8 inch springform pan with parchment paper then press the graham cracker and butter mixture to form an even layer on the bottom of the pan. Place in the fridge to set. 2. Preheat oven to 350. 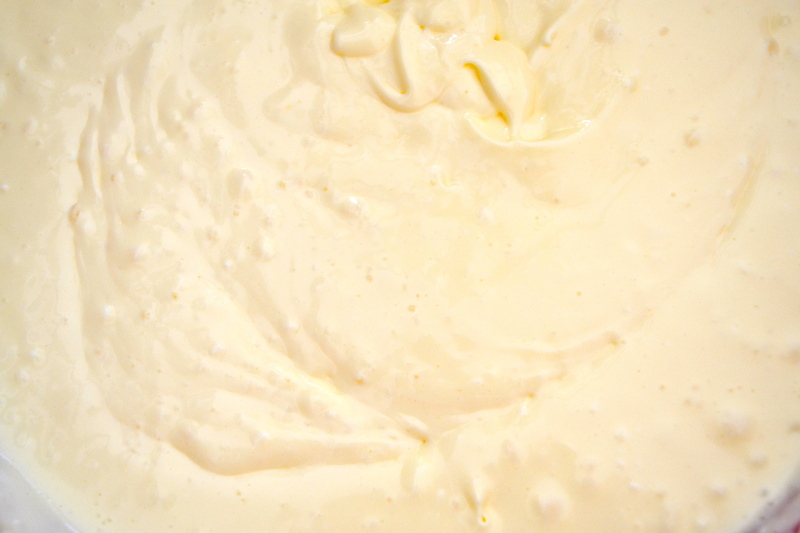 Beat cream cheese in a bowl until its smooth. Then add sugar. Beat in the eggs and egg yolks one at a time and then add the vanilla and lemon juice. 3. Put a kettle or pan on the stove and heat up water. 4. 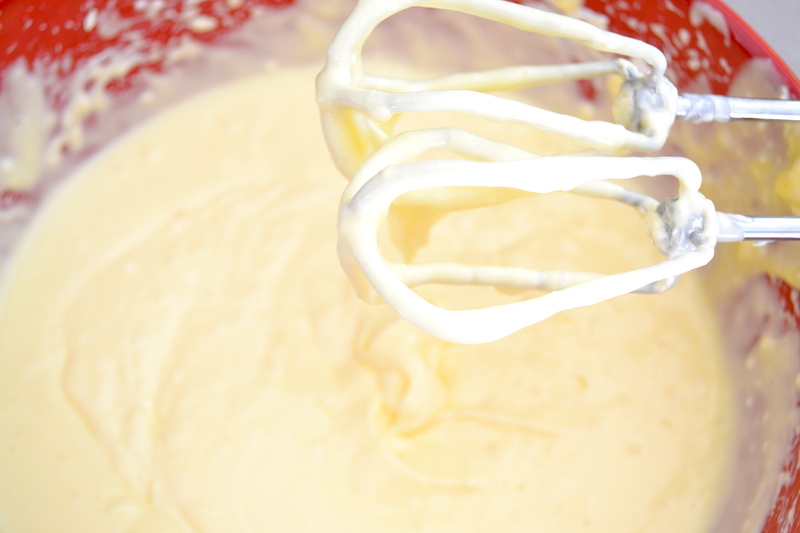 Split the cream cheese mixture evenly into two bowls. To one bowl add the pumpkin puree, cinnamon, nutmeg and ginger then beat well. To the other bowl add 3/4 cup of the caramelized white chocolate and mix well. 5. Line the outside of the chilled springform pan with foil so that it completely covers sides. This will protect it from the water in the water bath it will be cooked in. 6. Pour the pumpkin cream cheese mixture into the pan first and then pour the caramelized white chocolate cream cheese mixture over that. Use a knife to make swirls. 7. Place the springform pan into a larger roasting pan. 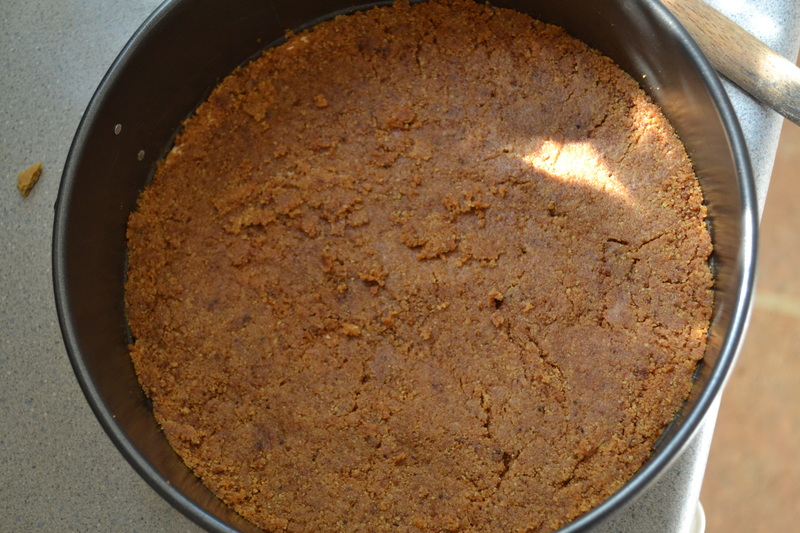 Pour hot water from the kettle or pan into the roasting pan around the cheesecake. Only fill it about halfway up. 8. Put it into the oven and cook for 70 minutes. It should seem mostly set on the outside but still have some jiggle in the middle. 9. 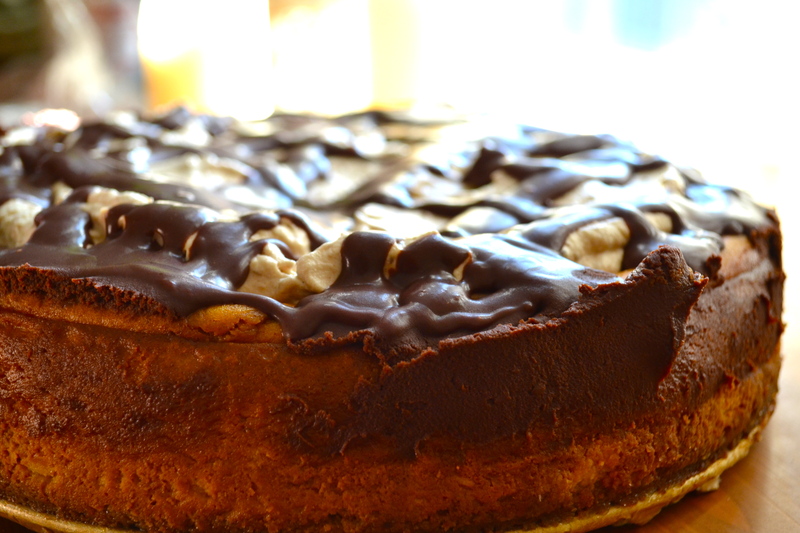 Remove the cheesecake from the oven and then let it cool completely before moving it into the fridge. It should chill in the fridge for at least 6 hours prior to eating. 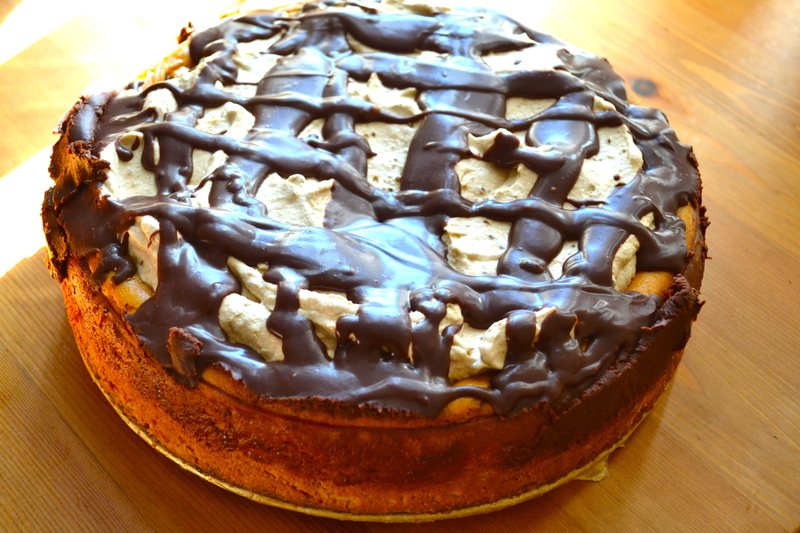 I think cheesecake always looks best topped with something whether it be berries or in this case caramelized white chocolate whipped cream and semi-sweet chocolate ganache. 1. Whip 1 cup of heavy cream with the caramelized white chocolate and cinnamon. Set aside. 2. 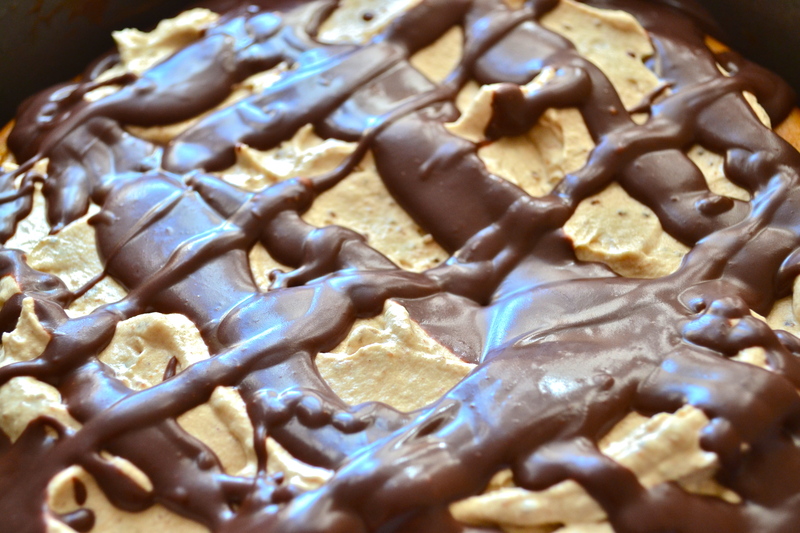 Melt the semisweet chocolate with 1/8 cup of heavy cream. 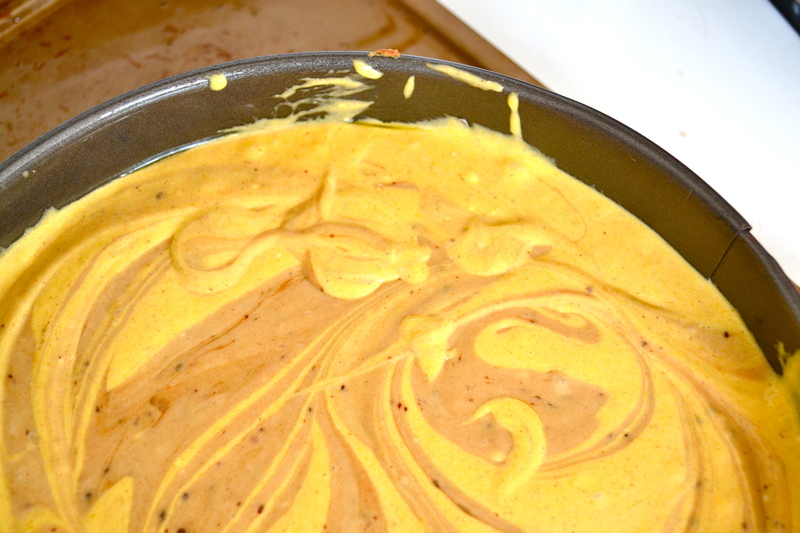 This can be over a double boiler but also with 30 second increments in the microwave. Mix until smooth. 3. 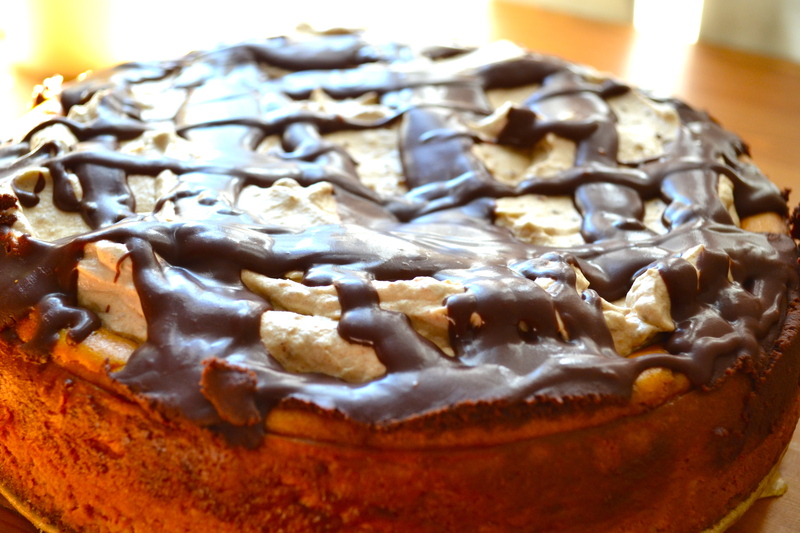 Once cheesecake is cooled top evenly with the caramelized white chocolate whippped cream. 4. 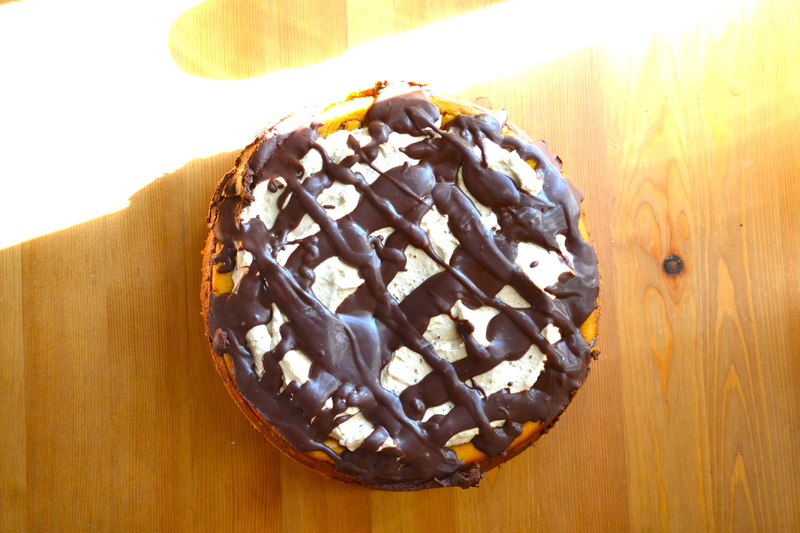 Once ganache has cooled a bit, but it still warm enough to be pourable, drizzle over the whipped cream. 1. 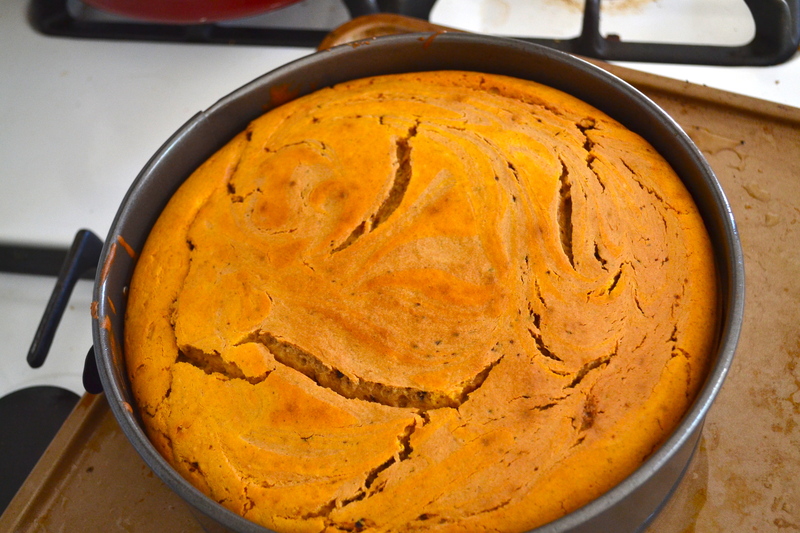 Obviously you can sub in pumpkin pie spice for the cinnamon, nutmeg and ginger powder in the cheesecake if thats easier. 2. 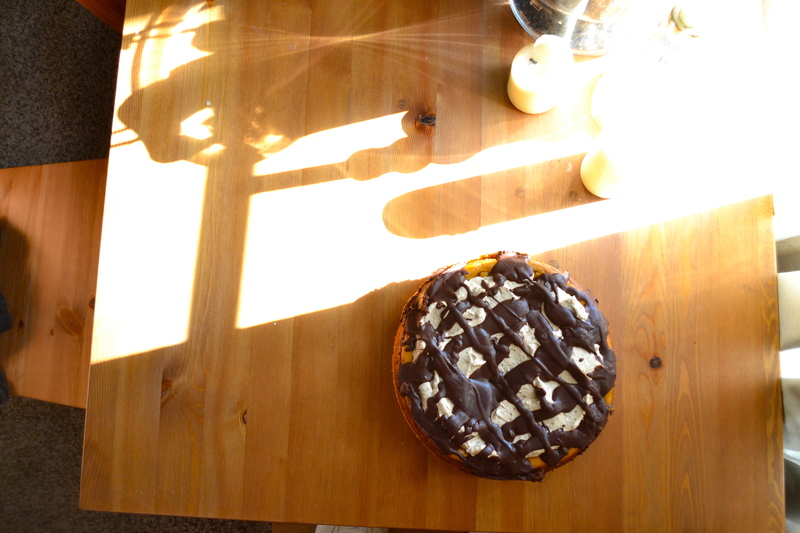 Make it a day ahead to ensure its properly chilled, cheesecake tastes so much better when its properly cold. 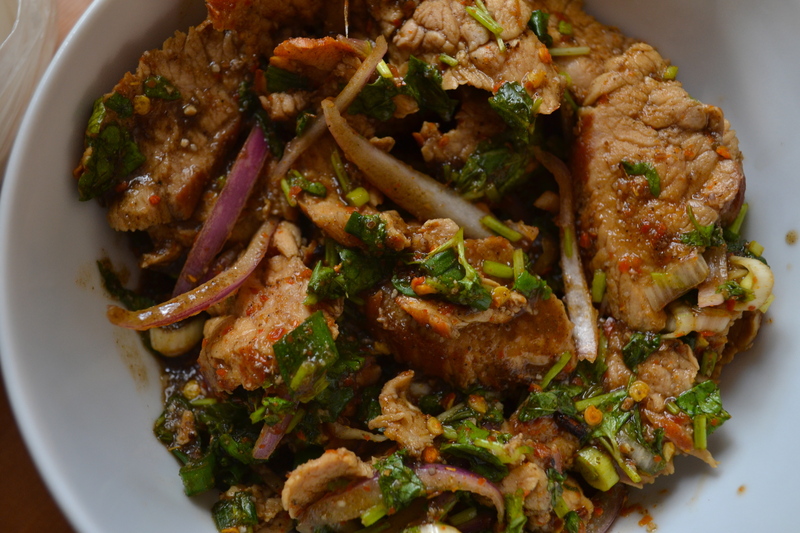 I’ve always wanted to try Sab-E-Lee having read many posts about the great quality of Thai food there. I think just mmm-yoso has about a million Sab-E-Lee posts, which all look verrry tempting. So I stopped by the Sab-E-Lee on Ulric Rd and got some Pork Nahm Tok and their Papaya Salad to go. They have a Yum-Woon Sen salad with shrimp and ground pork on glass noodles as well as a Nam Sod Salad that sounded more interesting than the papaya salad but according to them their papaya salad is “VERY POPULAR!! !” and the use of not one or two but THREE exclamation marks won me over. The location is verrrry small and despite them obviously being successful enough to open a second location this place is tiny and very bare bones. Don’t come here with a large group expecting to be seated right away. Or at all depending how large. The waitresses were friendly and the place was half full for lunch. I was happy to see the many kinds of chili you can top your meal with set out at the table just like we saw everywhere in Thailand. Now for the food. 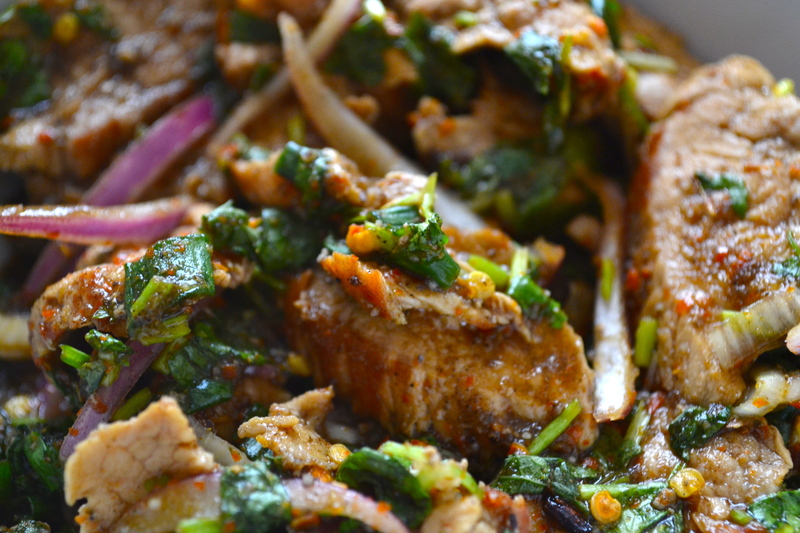 The pork nahm tok was very flavorful, the pork was thinly sliced and topped with lots of cilantro, red onion, and rice powder. Could have been a little more charred but the abundance of spices and herbs guarantees its anything but bland. 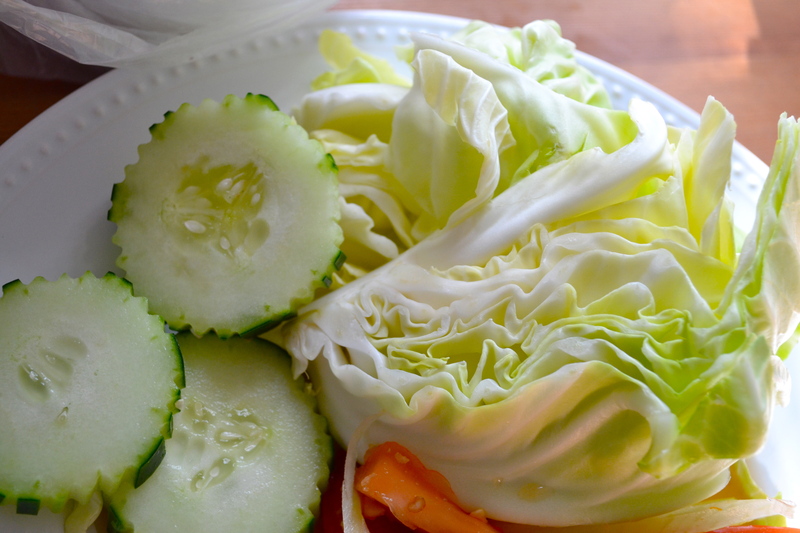 The nahm tok comes with cabbage and cucumbers for you to make little cabbage tacos with the pork. 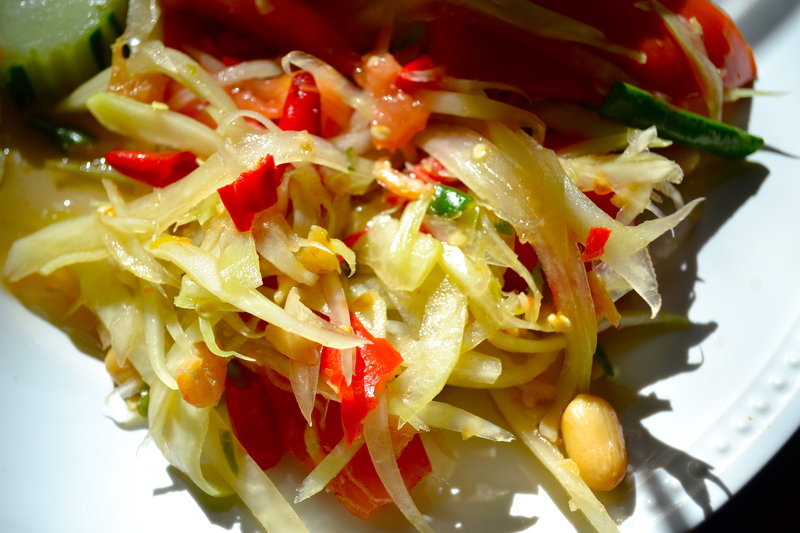 The papaya salad comes with green papaya, dried shrimps, sliced chiles, tomatoes, green onions, peanuts and has a very strong dressing. 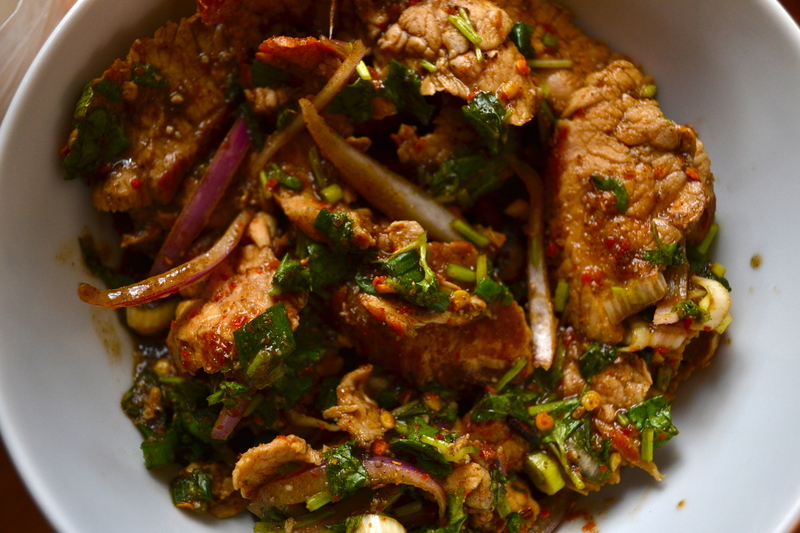 I personally liked it but I think people who have more reservations about fish sauce might be discouraged. Now the only downside: I read that their spicy levels are more legit than most Thai restaurants where a 10 is generally pretty unimpressive. So I was conservative and ordered a 4 (I would normally go with a 6). But even so the spiciness level was wayyy too high for me. 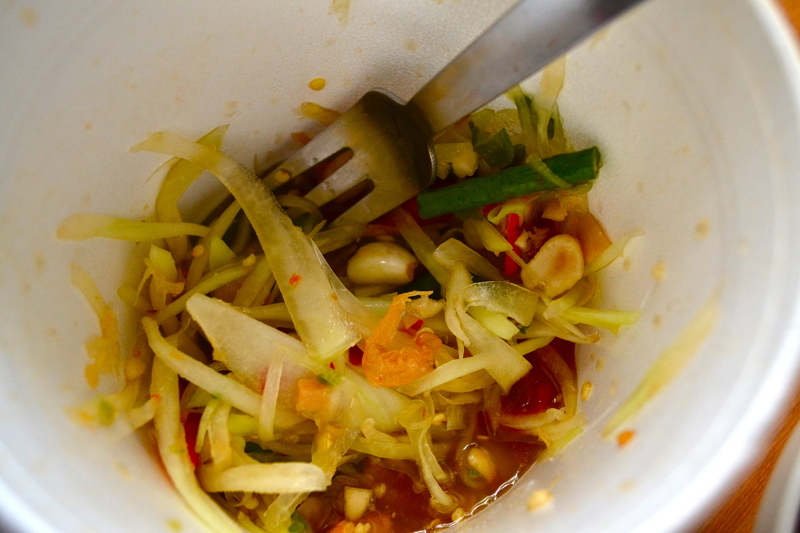 For the papaya salad there are slices of Thai chili and biting into one of those larger pieces made my eyes water. I generally avoided them after that but for the nahm tok the sauce itself was pretty spicy so there was not much to do. 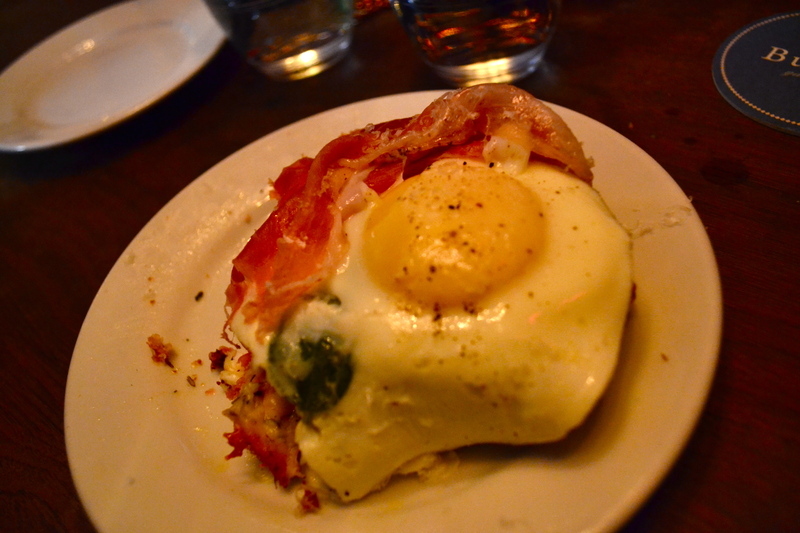 I ate I think half of both and then just kind of drank copious amounts of water for a prolonged period of time…. I will readily admit that my spicy tolerance is kind of mediocre though as I did not grow up eating spicy food so perhaps take this with a grain of salt. I do however love hot sauce on my breakfast burritos, jalapenos in my sandwiches and have sriracha in my fridge at all times so I have somewhat been indoctrinated into San Diego’s spicy loving ways. Overall despite the out-of-my-league spiciness I quite liked the food. 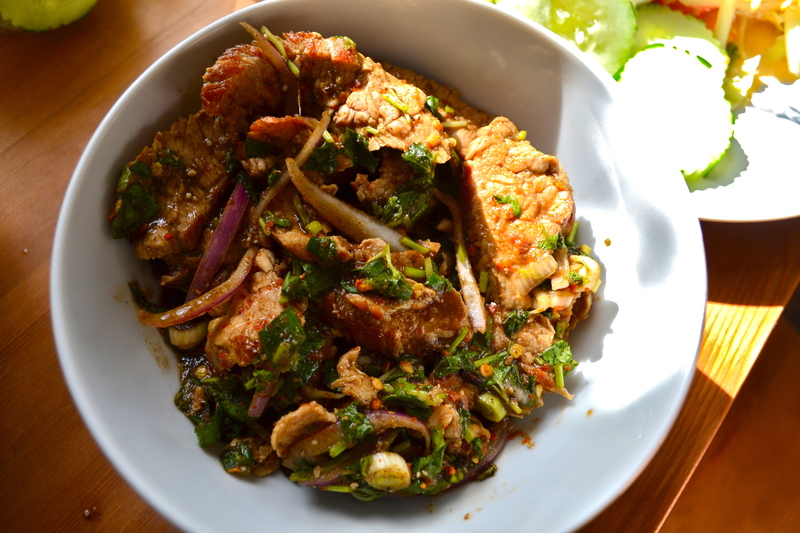 Will be back to try the Pad See Ew and the Pork Neck Nahm Tok! Will also probably order a level 2 (the shame).